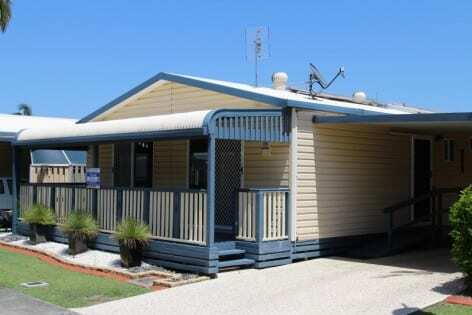 Modern two bedroom manufactured home with spacious tiled living area, modern kitchen with built-in appliances and stylish bathroom in the heart of picturesque Bilambil – coming soon! Burleigh Town Village is located in Township Drive. 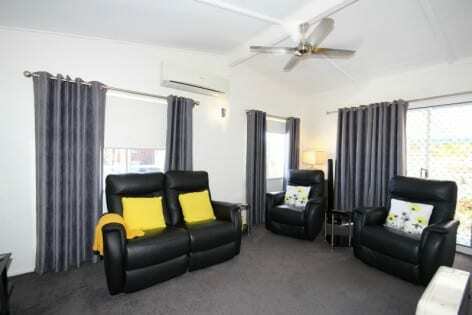 Burleigh Town Village is an over 50’s “Pet Friendly” residential park with new amenities. 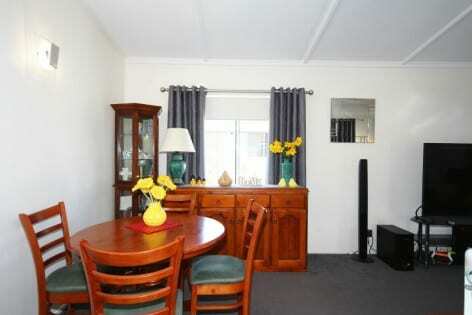 Delightful 2 bedroom house situated in popular park position with no rear neighbour. 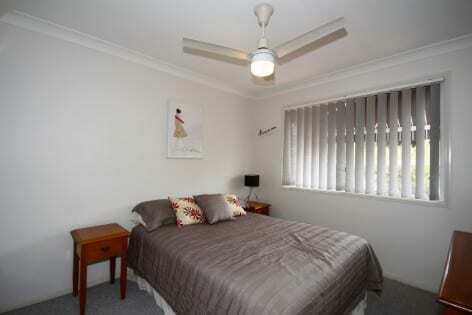 Also in no through street and with easy walking distance to amenities and bus stop. 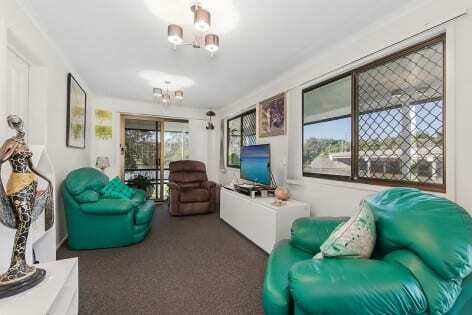 Bonus – Extra rear enclosed lounge/entertainment area with attractive garden nook. 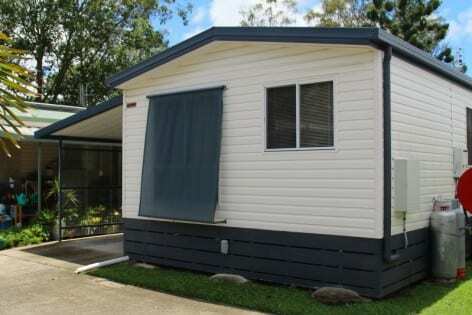 Outside there is a covered entertainment area with good sized lawn and 2 sheds. 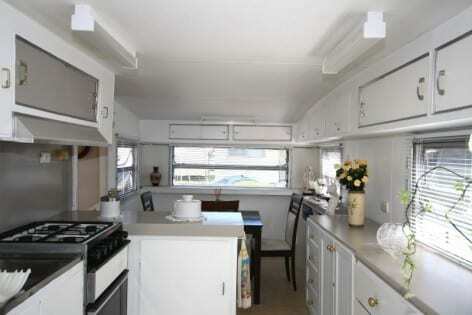 Another bonus is an enclosed garage and still room for a visitor car or second car. 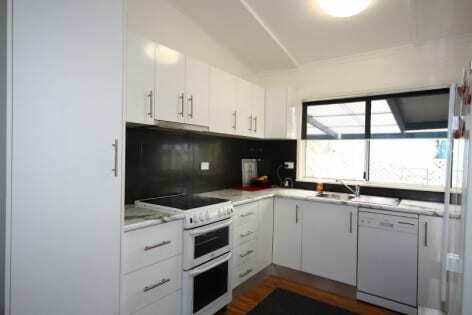 The kitchen has extra cupboards, a gas cooktop and good bench space. 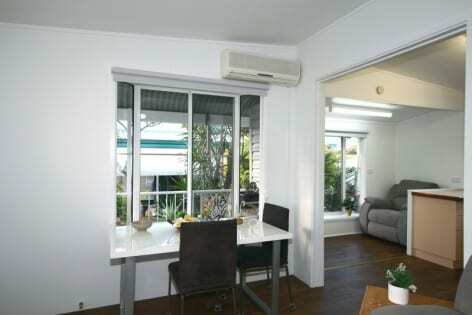 Airconditioner is above dining area, adjacent lounge and 2 large bedrooms. 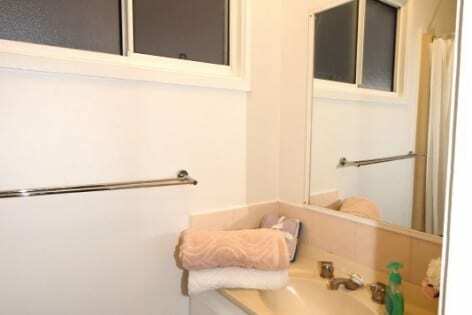 No waste corridor space – yet bathroom, toilet, and laundry are all separate. 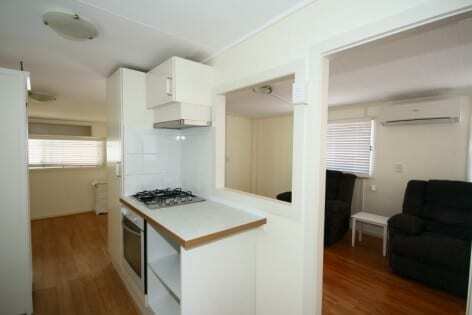 You buy the house and lease the land ($195 pw), no rates, BC or stamp duty. 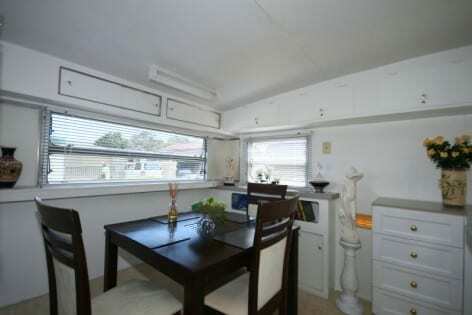 Owner has reduced price $10,000 to move close to life-long friend ASAP. 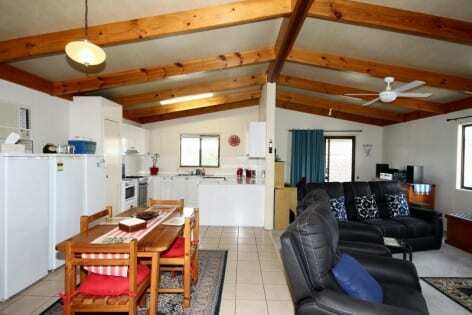 2 bedroom house in popular position near pool and recreation facilities. 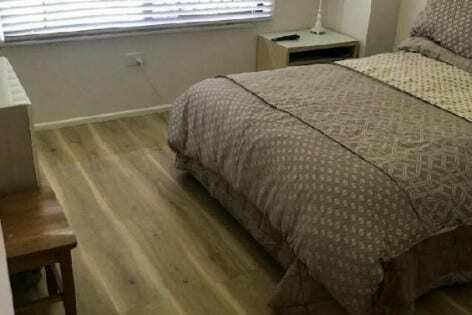 Timber look floors throughout (except bedrooms – both have built- in robes). 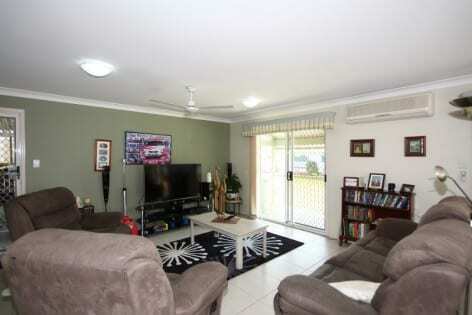 Open plan – large lounge area has air-conditioner which flows through whole house. 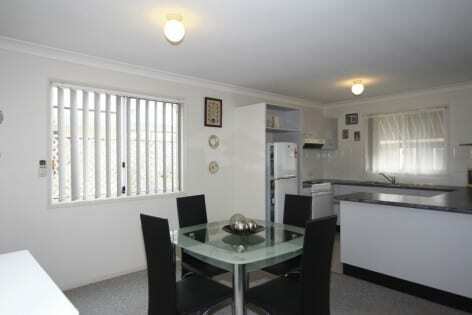 Dining area off u shaped kitchen which has bright outlook over the street. 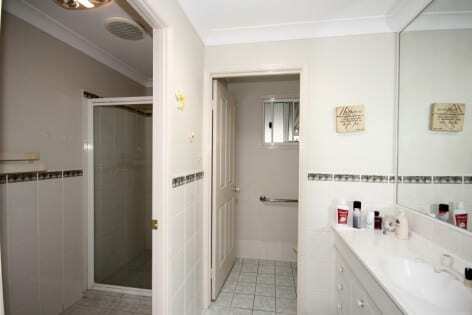 Separate toilet to bathroom. 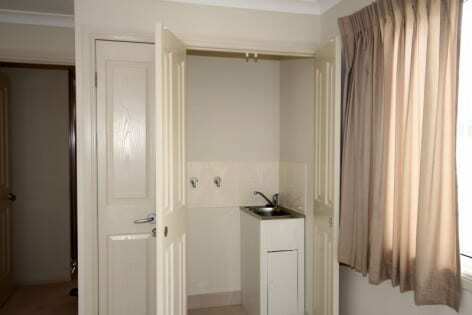 Large separate laundry with linen cupboard. 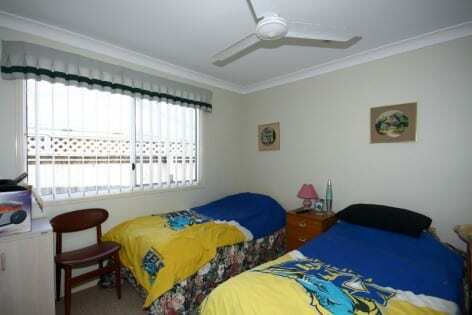 Both good sized bedrooms are at the rear for quietness and have ceiling fans. 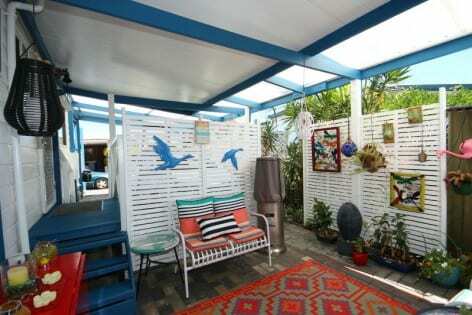 Paved double carport has room for outdoor enjoyment and entertaining. 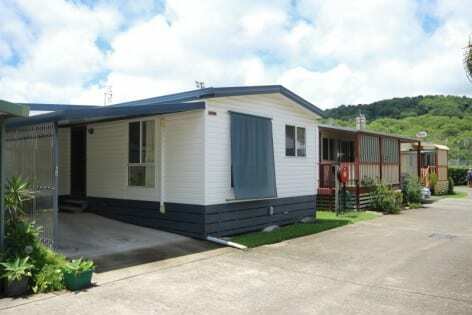 Very large shed is adjacent to low maintenance yard. Nothing to do. 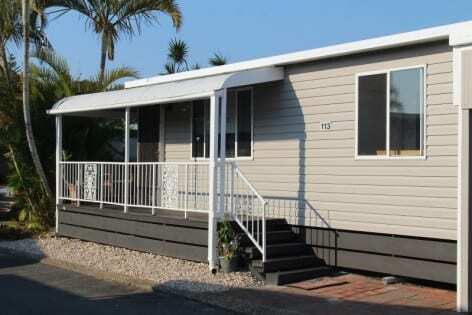 Don’t own the land (leases for $195 pw) Pay no rates, BC or stamp duty. 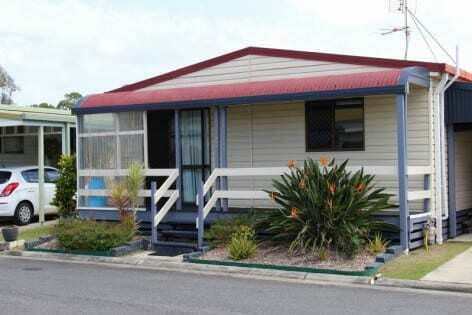 Owners have moved – ready to occupy and add your own touch. 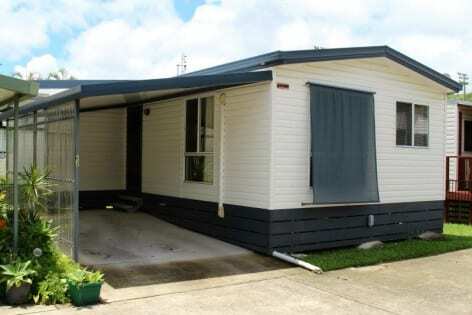 Rare opportunity to purchase a spacious three bedroom manufactured home located on the village perimeter with a rural outlook at the popular over 50’s Cobaki Broadwater Village – coming soon! 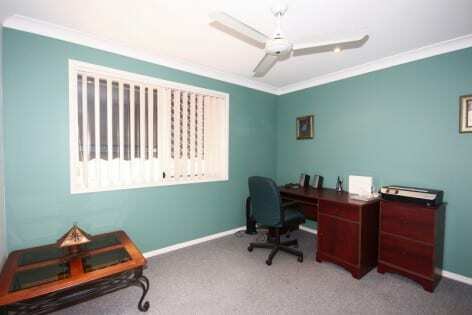 Please call us for full details and to arrange property inspection. 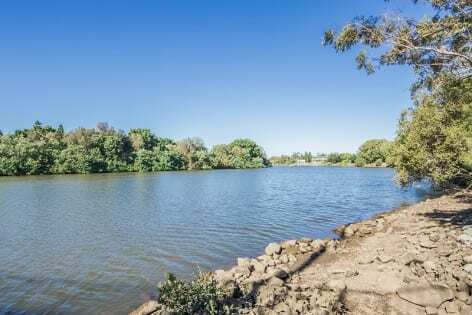 Cobaki Broadwater Village is set in 110 acres with its own lake stocked with fish and is perfect for the over 50’s who prefer to live in a secure, peaceful and relaxing environment and is positioned less than 10 minutes from the centre of Tweed Heads/ Coolangatta. 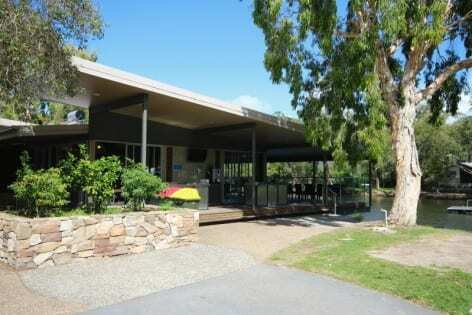 The Colonial Tweed Holiday and Home Park is located on the banks of the picturesque Tweed River. 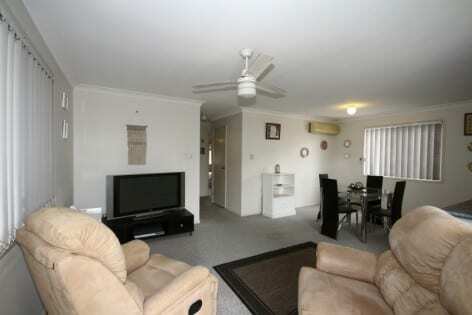 Well maintained, neat and tidy one bedroom home. 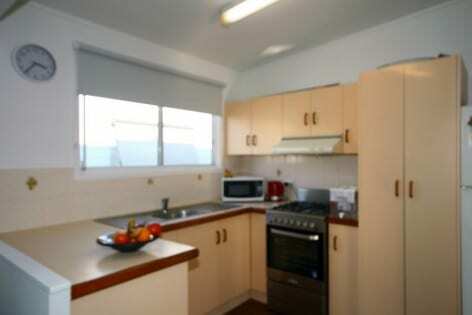 Light and airy modern kitchen with plenty of windows and cupboard space. 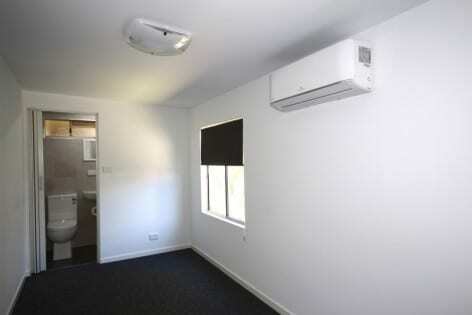 Air conditioner in the dining area. 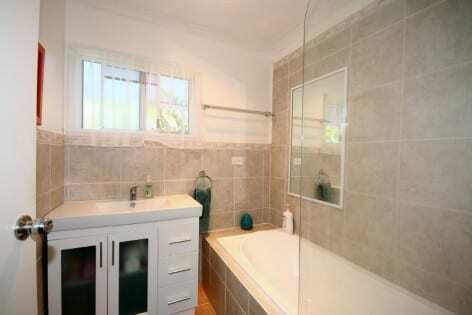 Lovely brand new bathroom, with a large shower and is fully tiled. 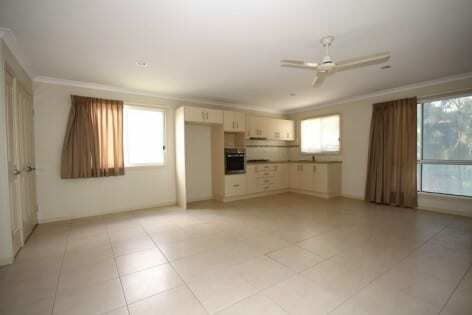 Tiled floors in the bedroom, lounge, kitchen dining area. 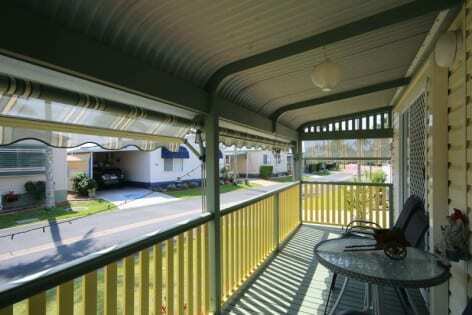 Spacious enclosed carport with shade screens. 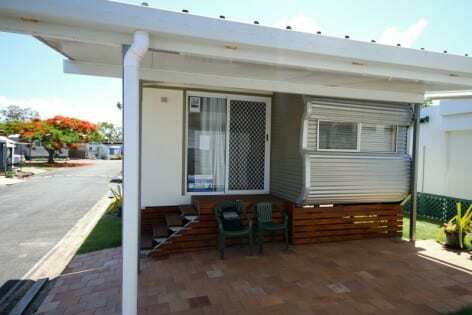 Also has a front entrance porch. 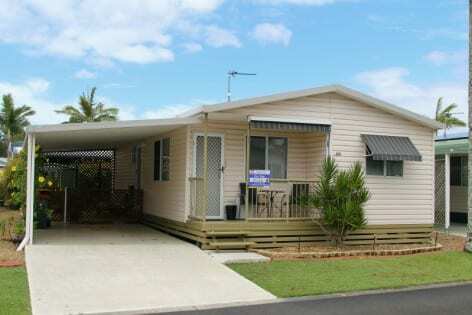 The park is perfectly located to enjoy the excitement of the Gold Coast to the north, with its many theme parks and, to the south, the ever popular Byron Bay. 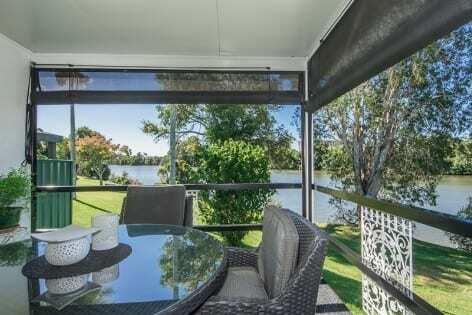 In the immediate vicinity, one may enjoy a wonderful array of restaurants, sporting clubs, entertainment venues, beaches and golf courses. 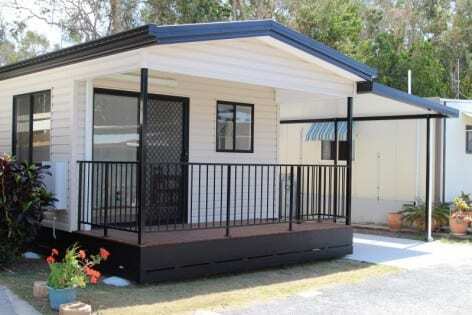 An almost new home for just $125,000 at Gateway Lifestyle Chinderah Lake. 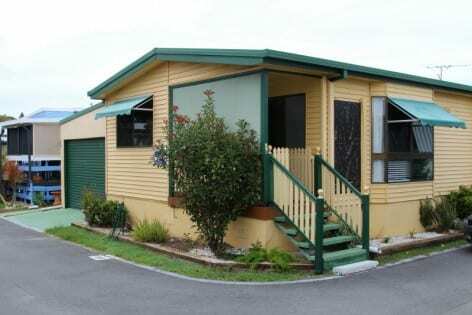 The over 50’s park is ideal for those who are looking for a relaxed lifestyle in a “Pet friendly” residential park. 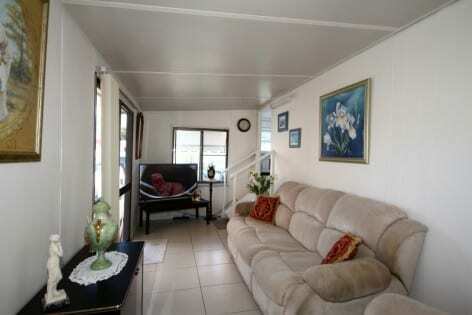 The home is located on one of the largest blocks and on the park perimeter. 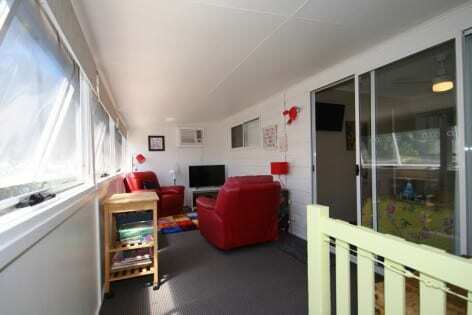 This light and airy relocatable home is not even 2 years old and is in immaculate condition. The home has an entrance porch, an open plan lounge/dining area and kitchen with raked ceilings and timber plank-effect vinyl flooring. 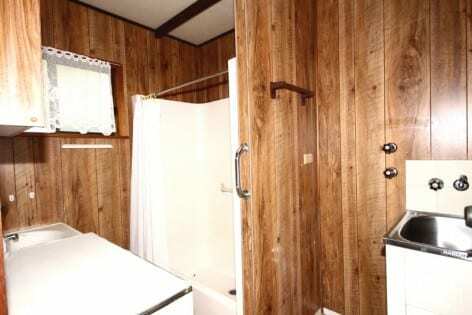 The home has a good-sized, master bedroom with a built-in robe. 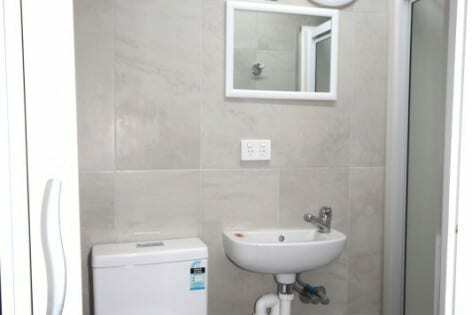 The vinyl floored bathroom consists of a bath with shower attachment, vanity unit and toilet with laundry facilities provided. 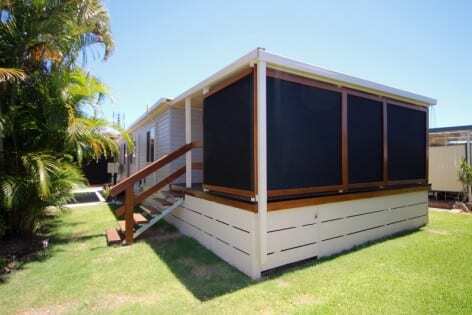 At the rear of the home is a timber deck which is covered and screened, making an ideal external entertaining area. The timber deck leads to the large garden that may be fenced and gated; making it an ideal home for your 4-legged companion. 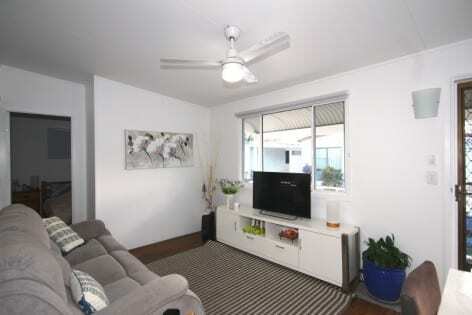 The home comes with Panasonic reverse cycle air-conditioning and a gas fired hot water service. 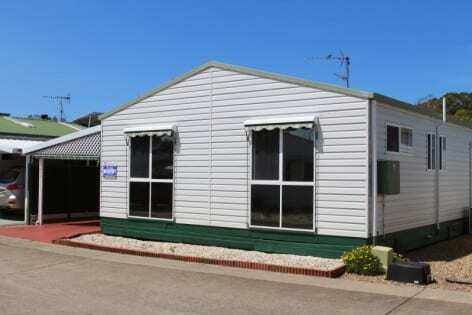 Adjacent to the home is parking for at least two vehicles or alternatively a caravan/boat and a car. 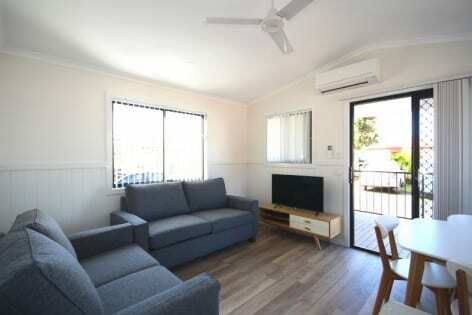 A “Pet Friendly” residential park with affordable housing. 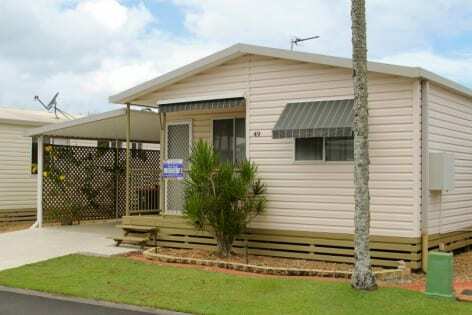 Gateway Lifestyle Chinderah Lake is an over 50’s ‘Pet Friendly’ residential park in the heart of Chinderah. 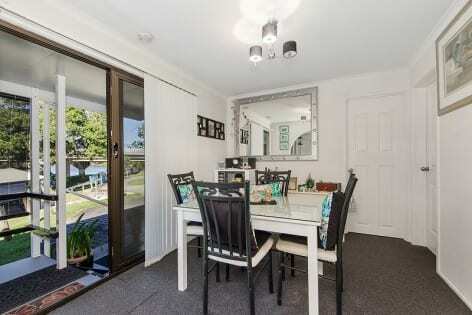 Charming and well-presented two bedroom home located – coming soon! 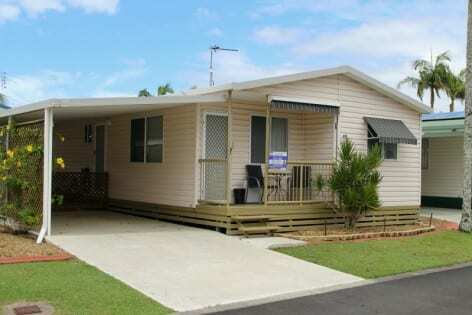 Immaculately presented and fully renovated two bedroom manufactured home with brand new kitchen and bathroom. 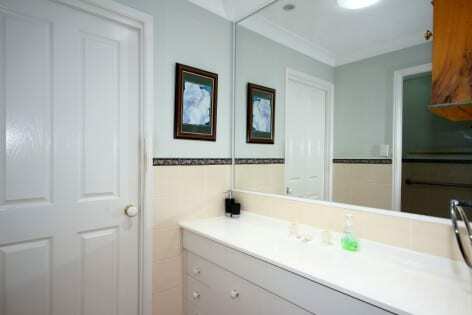 No expense has been sparred on the renovations, quality fixtures and fittings throughout the home. Simply move in and enjoy – coming soon. 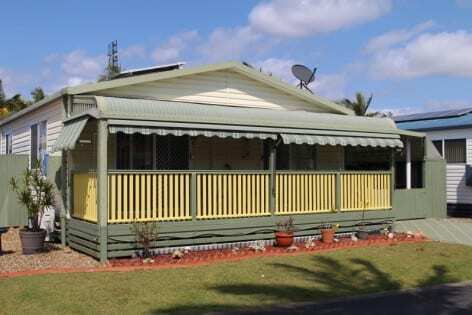 Gateway Lifestyle Tweed Shores – Over 50’s ‘Pet Friendly’ residential park in the heart of Chinderah. 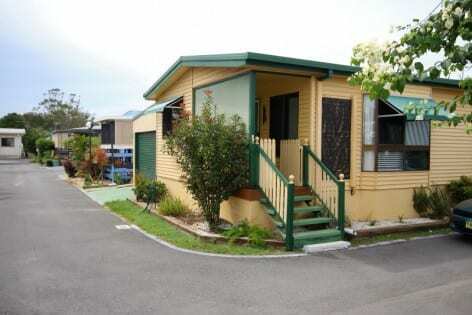 Charming and recently renovated two bedroom home located in a very quiet area of the park. 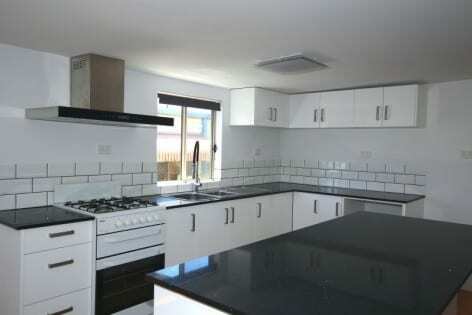 Brand new kitchen furniture, bench-tops/work surfaces & appliances. 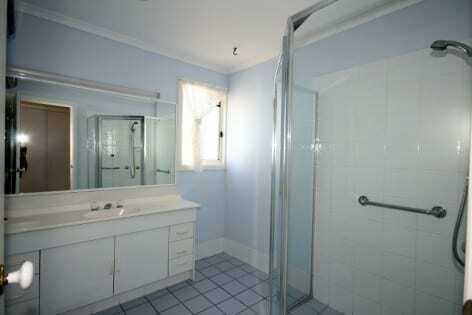 Fully renovated bathroom with new fixtures & fittings. 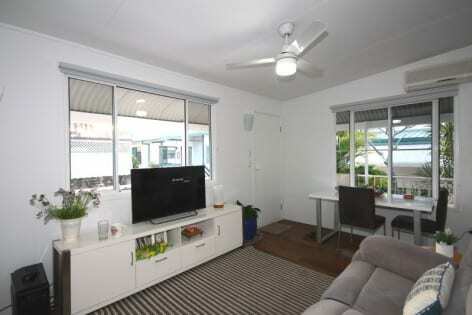 Gateway Lifestyle Tweed Shores is an over 50’s ‘Pet Friendly’ residential park in the heart of Chinderah. 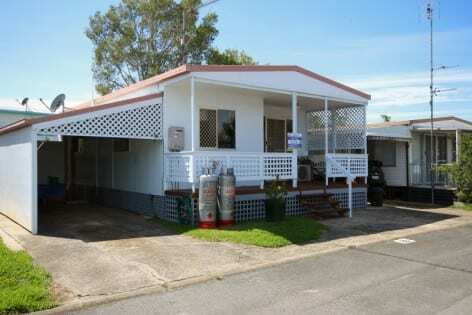 Immaculately presented and fully renovated two bedroom manufactured home with brand new kitchen and bathroom. 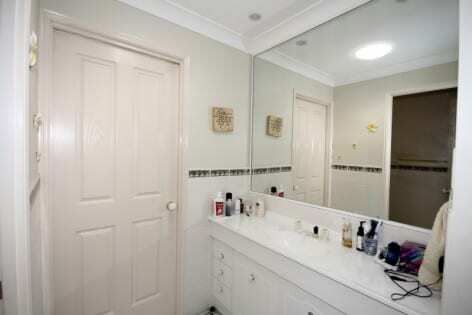 No expense has been sparred on the renovations, quality fixtures and fittings throughout the home. 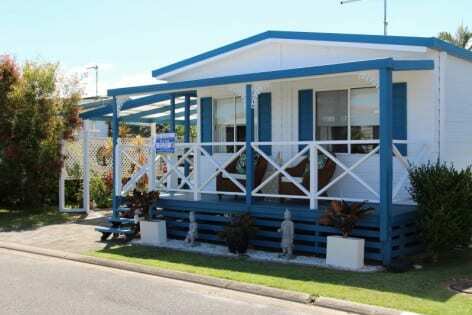 Simply move in and enjoy – coming soon! 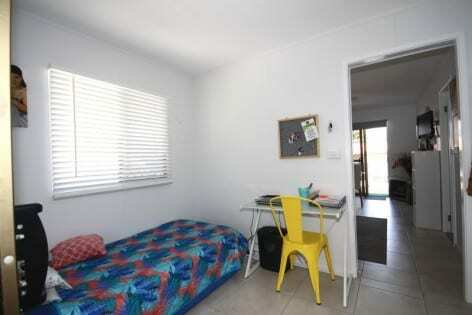 Charming and recently renovated two bedroom home located in a very quiet area of the park. 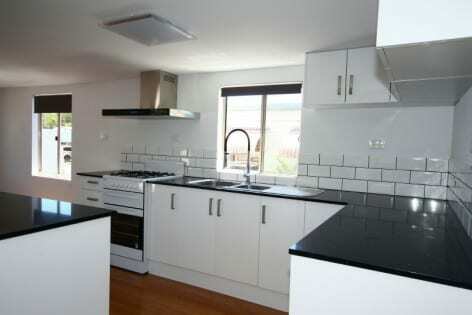 Brand new kitchen furniture, bench-tops/work surfaces & appliances. 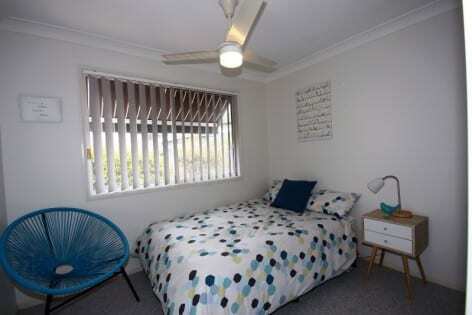 Charming and recently renovated two bedroom home located in a very quiet area of the park. 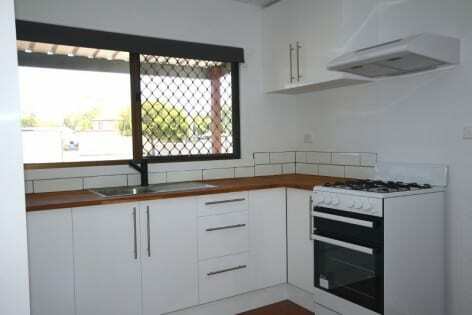 Brand new kitchen furniture, bench-tops/work surfaces & appliances, new flooring throughout, new hot water service, air-conditioner, blinds etc. 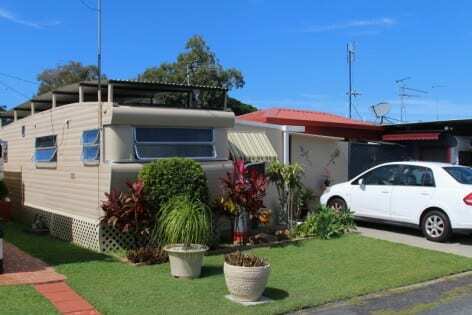 Charming good-sized two bedroom home that may be lived in “as-is” but would benefit from some renovations & redecoration with both front and rear verandas’ – coming soon! 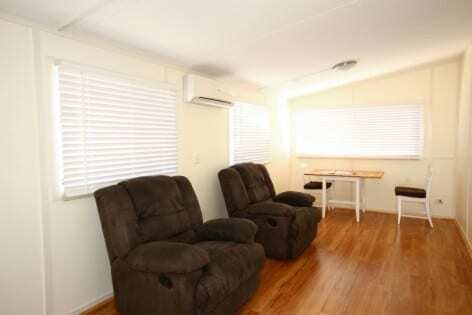 This home would ideally suit someone in a wheel chair that requires space to maneuver. 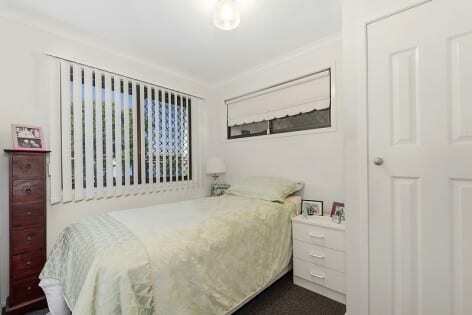 The home is located on the park perimeter and has a very large master bedroom, and a spacious conservatory/sun room running the full width of the home. 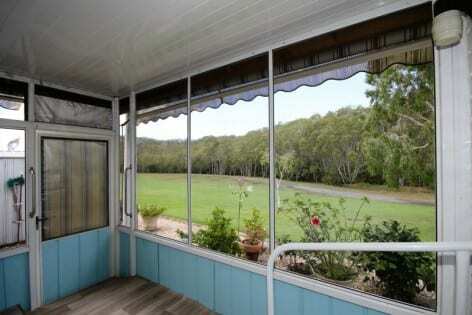 The light and airy sunroom may be used as either a 2nd bedroom or a day room/office and has a rural outlook across a paddock. 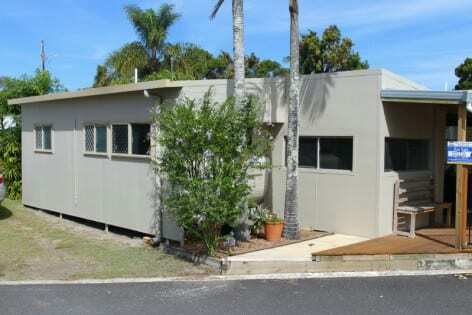 The North Star Holiday Resort is located a 20 minute drive south of Tweed Heads on the beautiful Tweed Coast and just a short stroll to a surf beach and tidal estuary. Resort amenities include three swimming pools, a 25m lap pool, three temperature controlled spas, sauna, gymnasium, hair dressing salon, snooker/pool tables, massage therapist, library and tennis court. 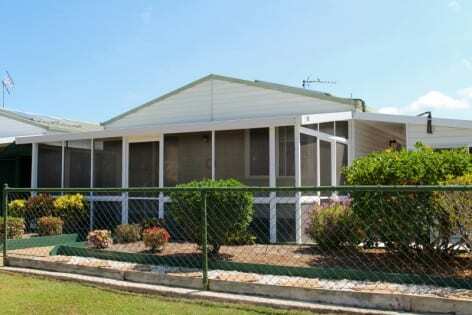 This large and immaculately presented manufactured home is located on a large corner block just a short stroll from the residents’ swimming pool and club house. 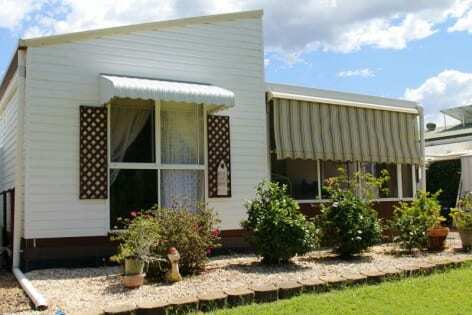 The home features an entrance verandah which runs the full width of the home with a pleasant outlook across the park. 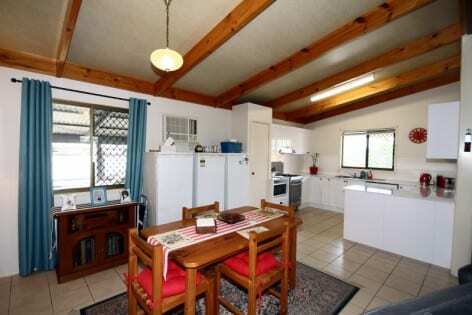 The home features spacious open plan living areas with raked cathedral ceilings and exposed timber beams. 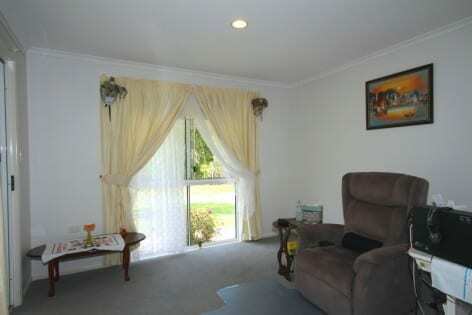 The living area is newly carpeted, the dining area and kitchen have tiled floors; and the bedrooms are carpeted. 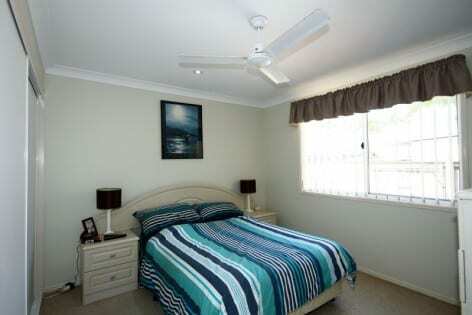 The two good-sized bedrooms each have their own air conditioners, built-in robes and ceiling fans. 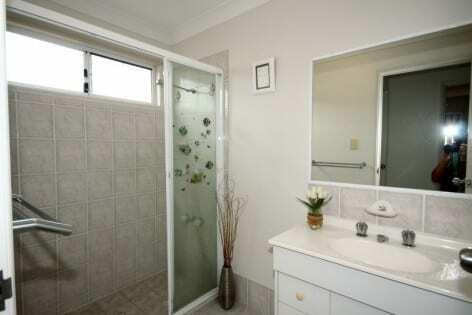 The tiled bathroom comprises of a shower cabinet, stylish vanity unit and toilet. 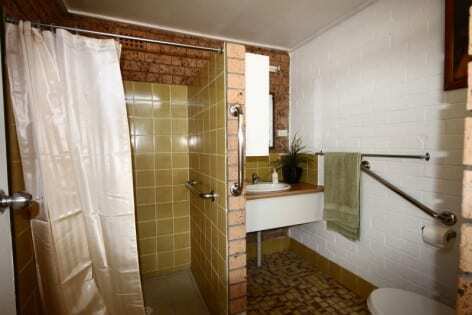 Plus, there is a separate guest toilet and an internal laundry. 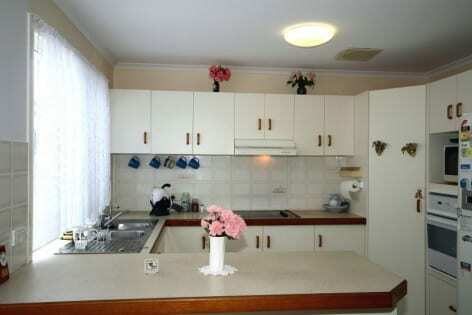 The kitchen has recently been fully renovated. 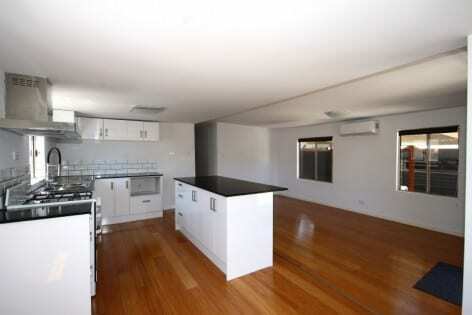 Renovations include new cabinets with sparkling 2-Pac white doors and light stone-effect laminate benchtops/work surfaces. 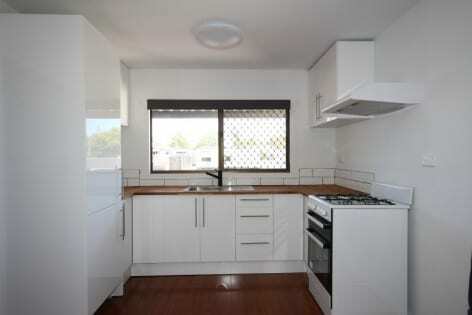 The kitchen has tiled splashbacks, double stainless steel sink and is complemented with brand new appliances including a gas stove and dishwasher. 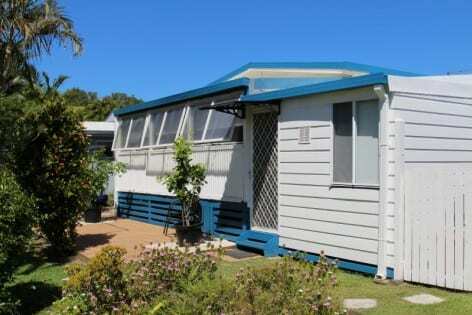 This energy efficient home has a Solar hot water service and Solar panels with an inverter. 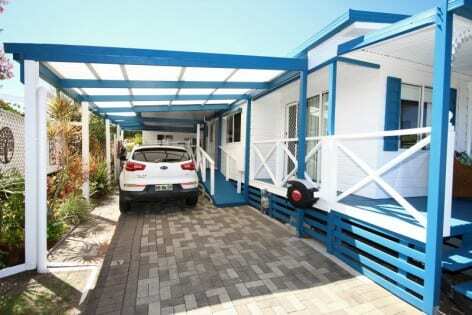 Adjoining the home is a carport with good headroom and space for two small vehicles. 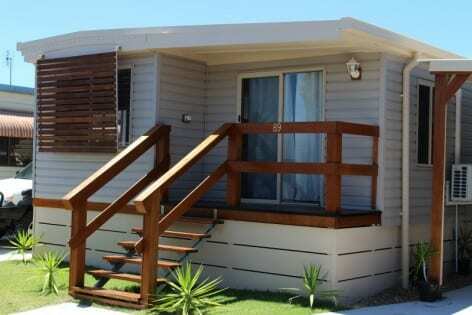 The resort is renowned for spacious, comfortable and affordable luxury homes in a secure and peaceful environment. 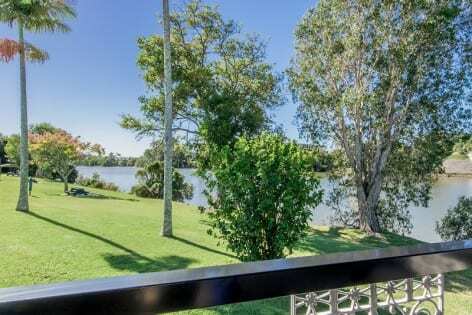 Located 20 minutes drive south of Tweed Heads on the beautiful Tweed Coast and just a short stroll to a surf beach and tidal estuary. The resort amenities include three swimming pools, a 25m lap pool, 3 temperature controlled spas, sauna, gymnasium, hair dressing salon, snooker/pool tables, massage therapist, library and tennis court making it an ideal living environment. 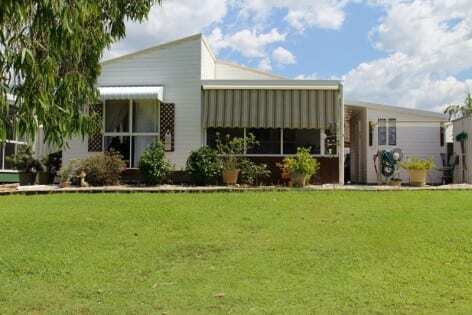 This home is located on a large block and has a pleasant outlook from the front verandah which runs the full width of the home across to the permanent residents’ own swimming pool and club house. 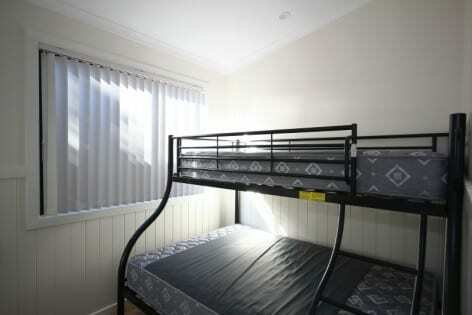 Plus,it is just a short distance from the Aquatic Centre where the lap pool, gymnasium and sauna are housed. 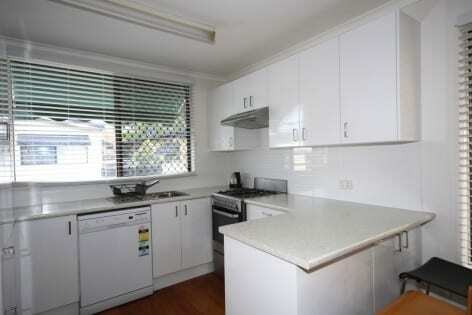 This immaculately presented home has been fully renovated throughout with no expense spared. 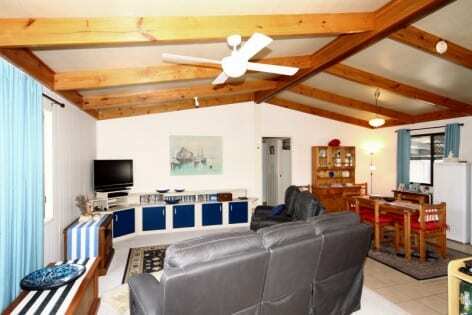 The open plan home features timber laminate floored living areas with raked cathedral ceilings and exposed timber beams. 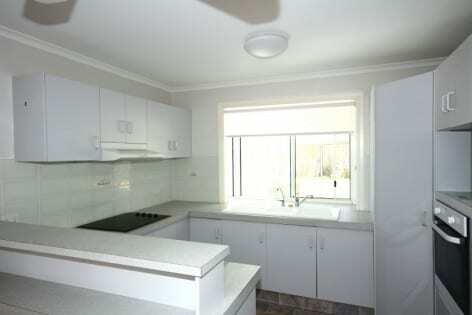 The newly renovated kitchen has new cabinets with stone effect laminate bench-tops/work surfaces and is complemented with brand new appliances. 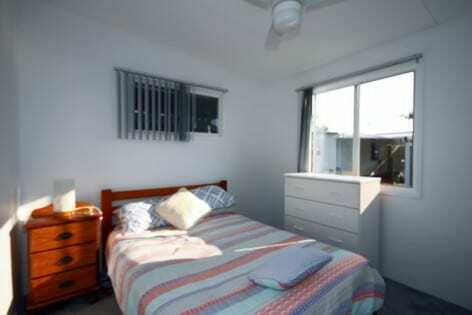 There are two good-sized bedrooms; master with a walk-in robe and the 2nd bedroom has a built-in robe. 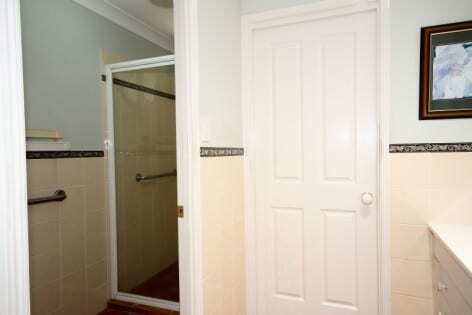 The tiled bathroom has been fully renovated with new fixtures and fittings. 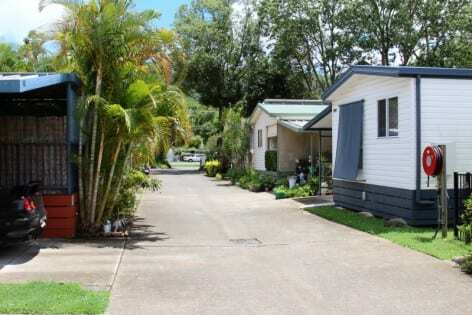 The over 50’s Palm Lake Resort Banora is situated at a prestigious location close to shopping centres and sports clubs which include some of Australia’s top bowling and golf venues. 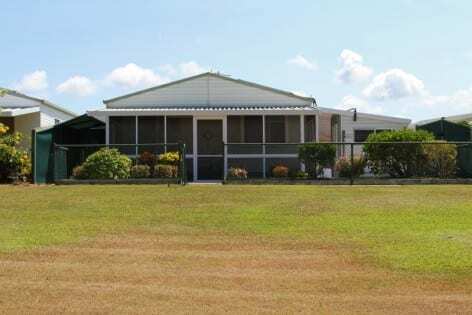 Resort amenities include swimming pool, spa, indoor & outdoor bowls, croquet, snooker/pool & billiard tables, massage therapist, library and community hall. 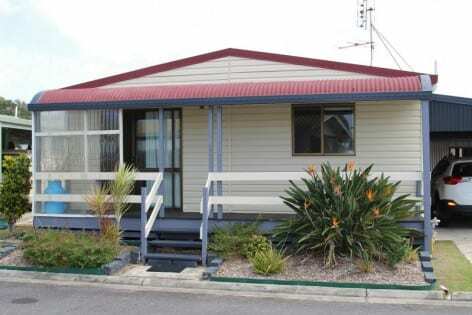 This neatly presented, light and airy manufactured home has spacious open plan living areas with high raked cathedral ceilings. 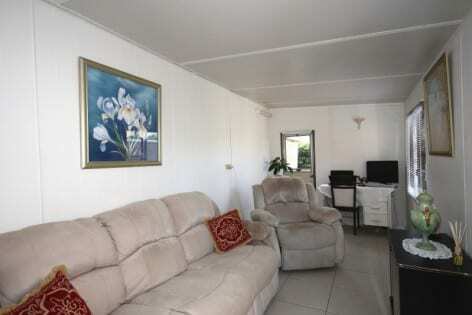 The home is centrally located close to the swimming pool and the resort’s grand hall. 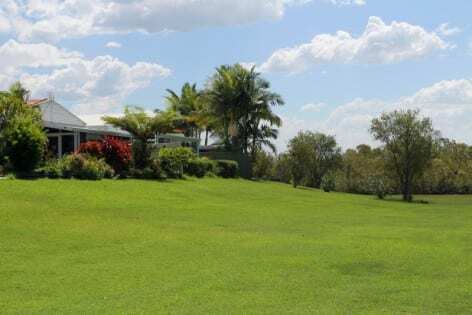 At the rear of the home there is a paved entertaining area, partially covered with a shade-sail, with a low maintenance fully fenced garden, making it ideal for your four-legged companion. 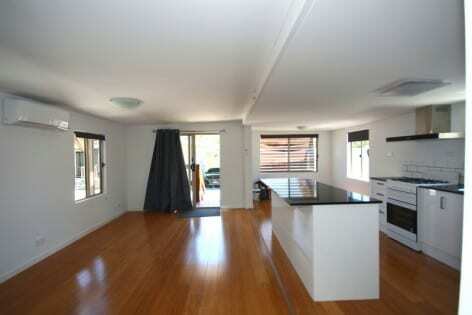 The living area comprises of a carpeted lounge with an adjacent carpeted dining area and vinyl floored kitchen. 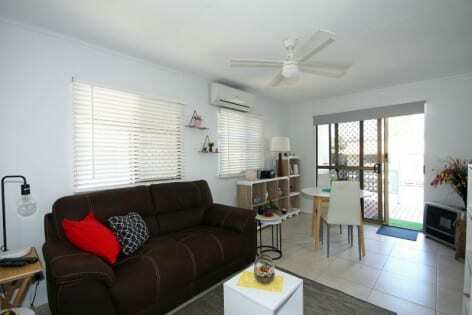 The living area has a reverse cycle air conditioner and ceiling fans. 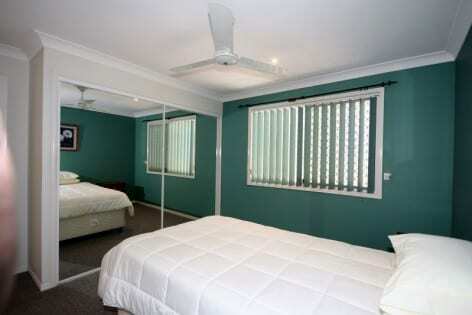 The two good-sized carpeted bedrooms have built-in robes and ceiling fans; master bedroom robe has mirror doors. 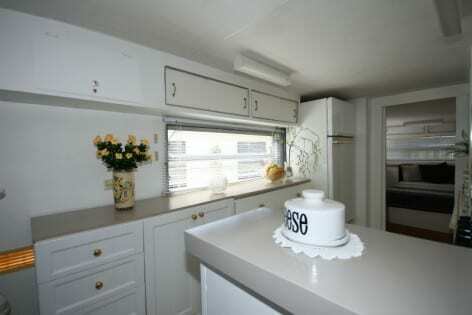 The kitchen has a built-in Simpson oven/grill and ceramic cook-top with plenty of storage and bench space. Plus, there is a relatively new Fisher & Paykel dishwasher. 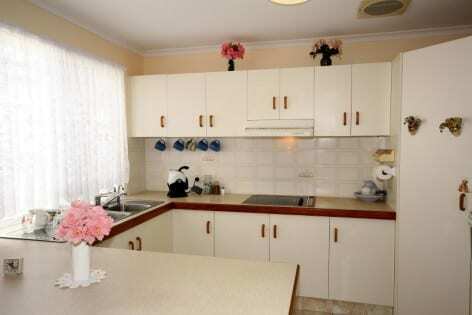 The kitchen is complemented with rounded edge mauve coloured, mottled-effect laminate bench-tops and white laminate panel doors, a stainless-steel sink and tiled splash-backs. 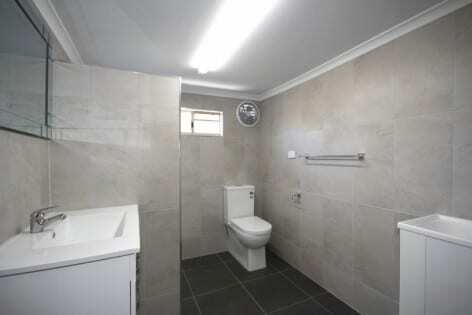 The tiled bathroom comprises of a large shower cabinet with bench seat and a good-sized vanity unit with a separate toilet. 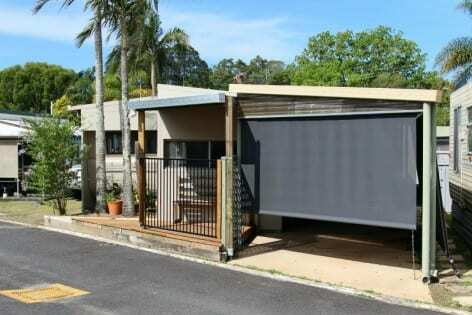 A garage with remote operated roller door adjoins the home, with the laundry at the rear of the garage. There is public transport at the entrance of the resort and free shuttle buses to local clubs. 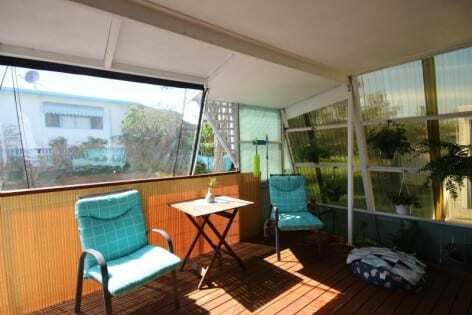 The home consists of a caravan with tropical roof and an adjacent ridged annex. 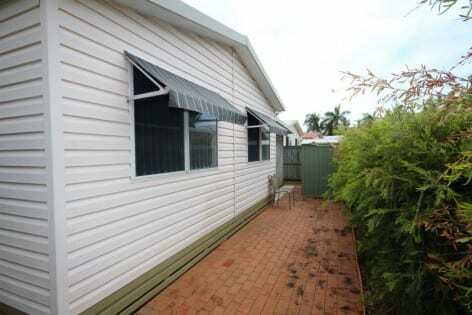 It is located on the park perimeter and has recently been renovated throughout. 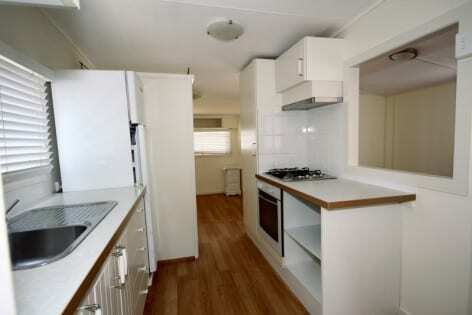 The renovations include new vinyl floors in the kitchen/dining area and bedroom. 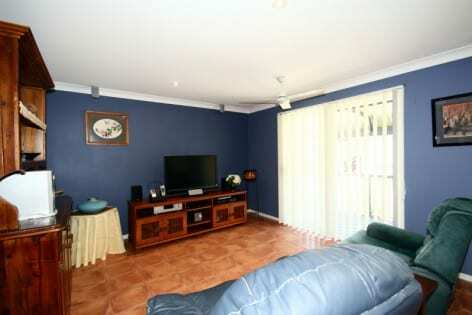 Ceramic tiles have been laid in the cosy living room. 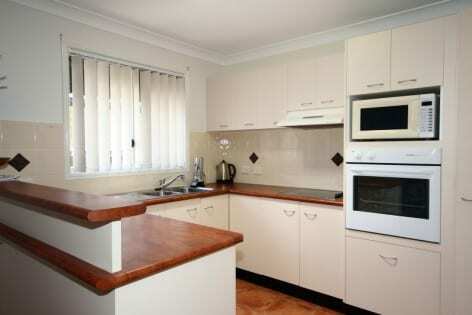 Kitchen renovations include new cabinets with stone effect laminate bench-tops. 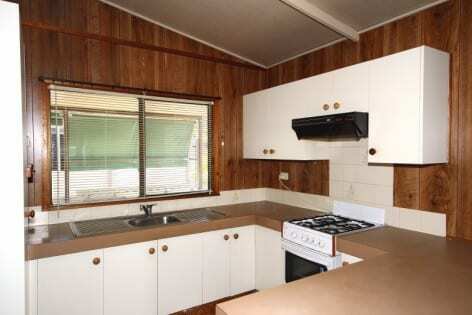 There is a gas stove, rangehood and a stainless-steel sink. 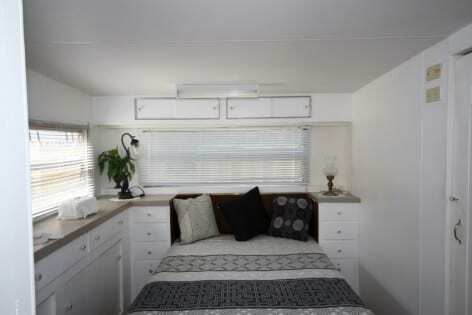 There is a good-sized bedroom with built-in robe and plenty of storage space. 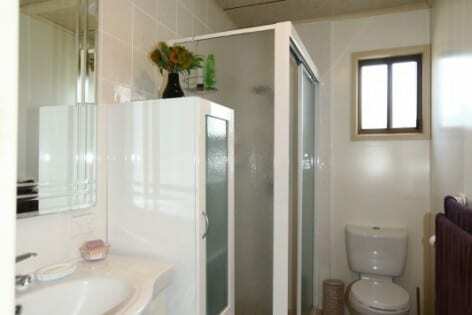 The home has an external en-suite bathroom that consists of shower, vanity and toilet. Plus, there is an entrance porch, car space, two garden sheds and a very private rear patio that is fenced and covered, allowing it to be enjoyed throughout the year for entertaining. 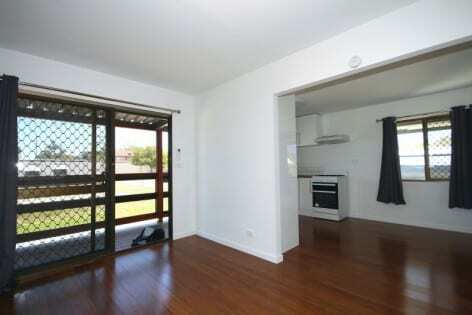 This light and airy home is ready to be moved into and enjoyed at a very fair price. 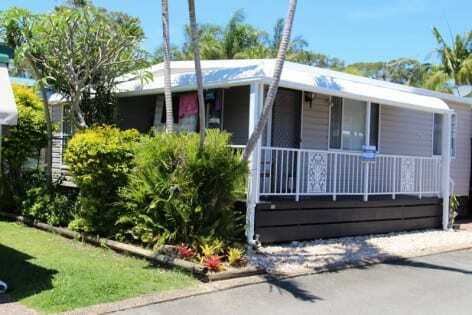 Charming and character rich two-bedroom home that has recently been redecorated at the Pyramid Holiday Park, Tweed Heads – coming soon! 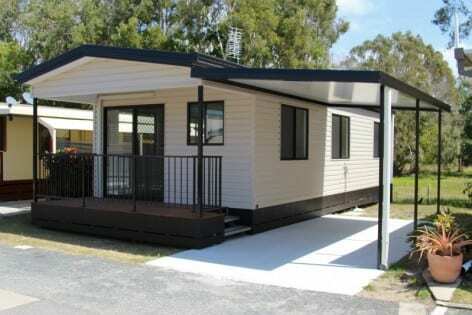 A brand-new home direct from the factory for just $179,000 at the over 50’s Pyramid Holiday Park. 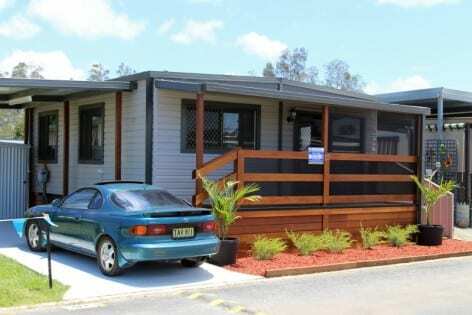 The Pyramid Holiday Park is situated just minutes from Tweed Heads/Coolangatta and is ideally located for the over 50’s to enjoy everything the Gold Coast, Tweed Valley and Tweed Coast have to offer in a secure environment. 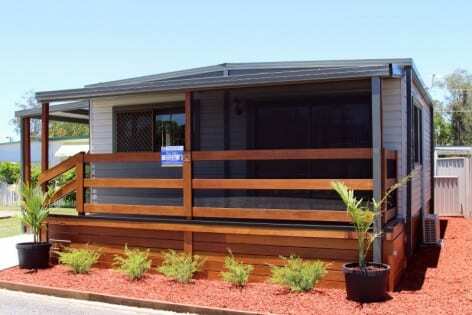 These brand-new relocatable homes are perfect for people looking to downsize at a very affordable price. 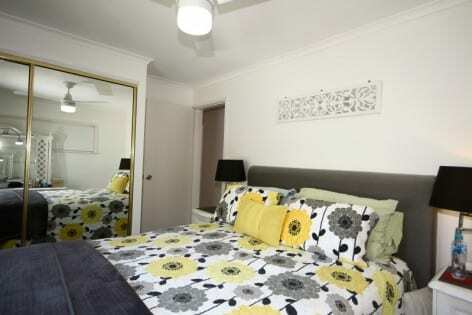 The homes are light and airy and are located on the park perimeter. 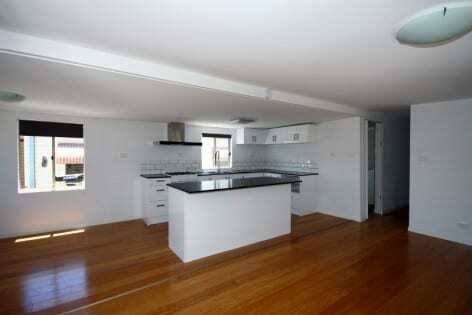 They have open plan lounge/dining areas and kitchens with high raked ceilings and timber plank vinyl flooring throughout. 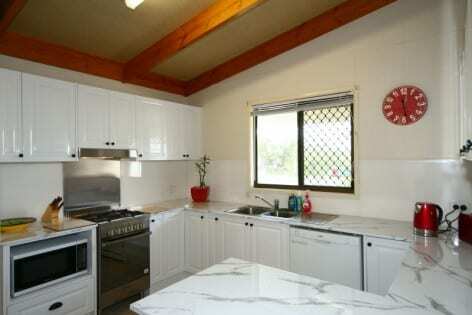 The modern kitchens have plenty of storage space with stone effect laminate bench-tops and white panel doors. 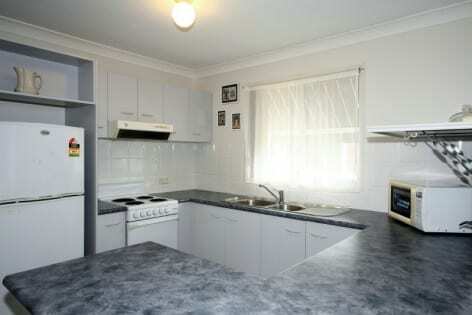 The kitchens are complemented with tiled splash-backs, a stainless-steel sink and a stainless-steel Euromaid gas stove. 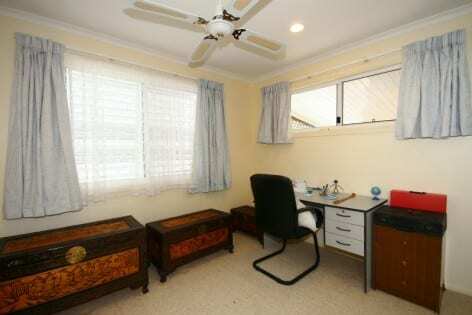 These homes have a good-sized master bedroom and a single-sized second bedroom that would make an ideal office. 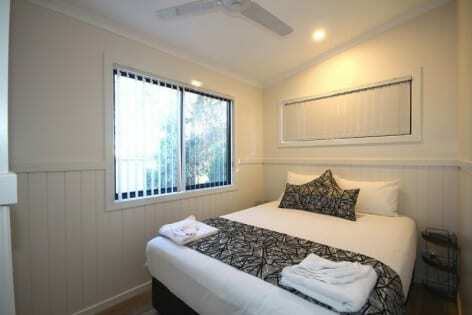 Both bedrooms have timber effect vinyl flooring and built-in robes. 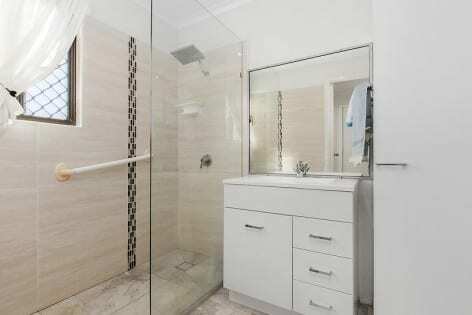 In each home the vinyl floored bathroom consists of a shower cabinet, stylish vanity unit and toilet with laundry facilities and optionally an internal laundry may be installed. 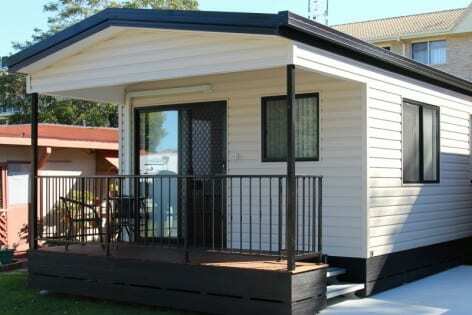 The homes come with Panasonic reverse cycle air-conditioning, gas fired hot water service, and single carport. 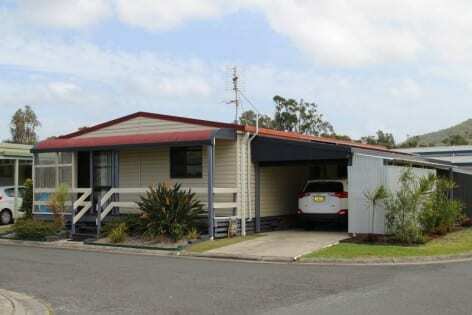 Charming two-bedroom home located on a corner block with adjacent visitor parking at the Pyramid Holiday Park, Tweed Heads – coming soon! 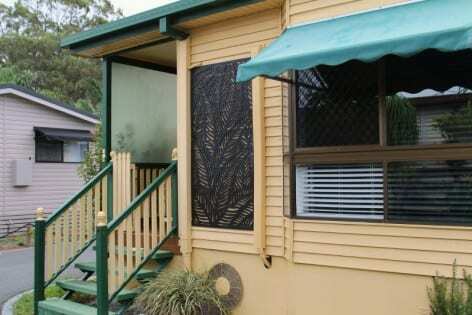 This charming home has recently been renovated and redecorated and at $119,000 represents excellent value for money for a relocatable home in a first-class residential park. 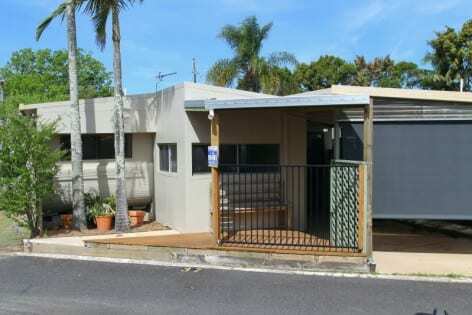 The home is located on a corner block in a quiet area of the park and consists of a fully enclosed entrance porch, a newly carpeted lounge area and a vinyl floored kitchen with high raked ceilings throughout the living area. 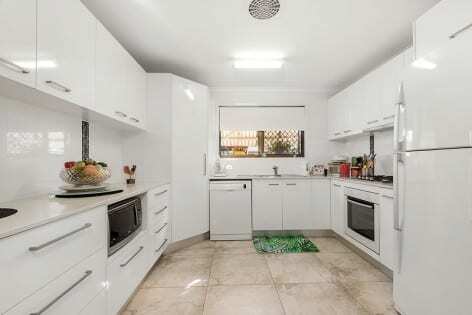 The newly renovated kitchen has plenty of cupboard/storage space with light marble stone effect laminate bench-tops and flat white panel doors with stainless steel handles. 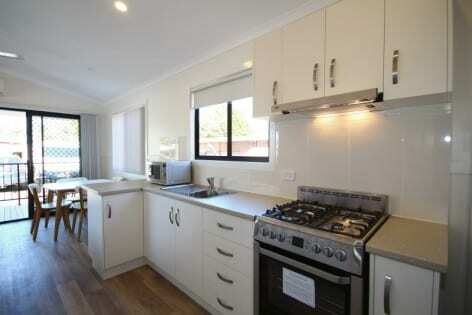 The kitchen is complemented with glass splash-backs, stainless steel sink and a Chef gas-stove. 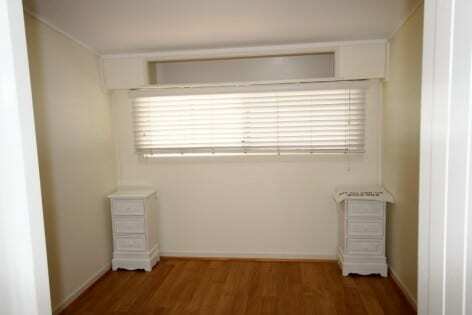 The home has two good-sized newly carpeted bedrooms with built-in robes; master with mirror doors and its own reverse cycle air-conditioner. 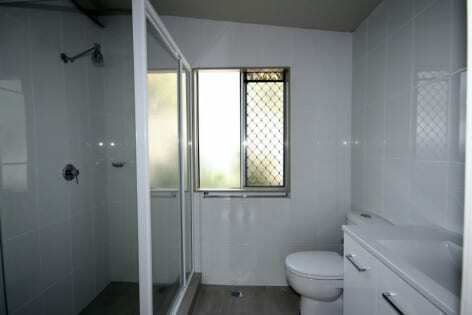 The recently renovated and tiled bathroom consists of a shower cabinet, new vanity unit and a new toilet. 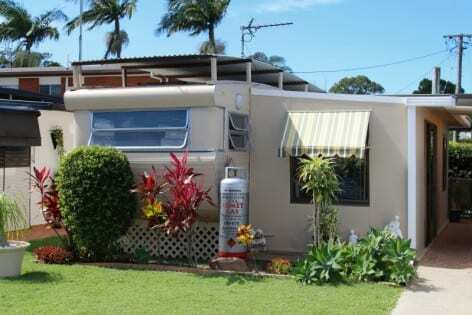 The home has an internal laundry, single carport, brand new reverse cycle air-conditioner in the living area, gas-fired hot water service and a garden shed. 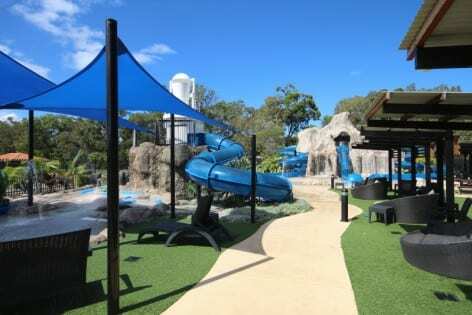 The park has a swimming pool, BBQ area and recreation/games room. The reception is open 7 days a week, sorry no pets permitted. 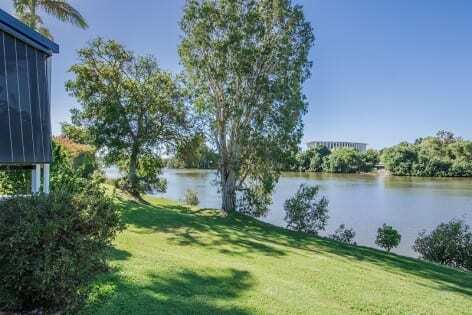 Riverside Home Park – Over 50’s Residential Park, sorry no pets permitted – located on Nerang Broadbeach Road next to Metricon Stadium. 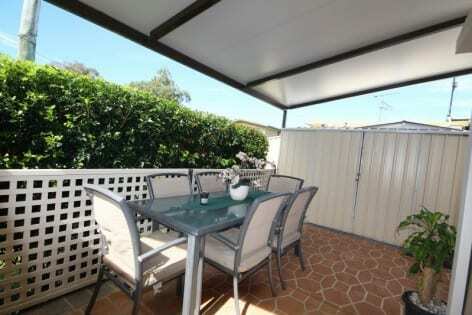 Wonderful outdoor living/dining area. Great for breakfast, lunch and dinner. 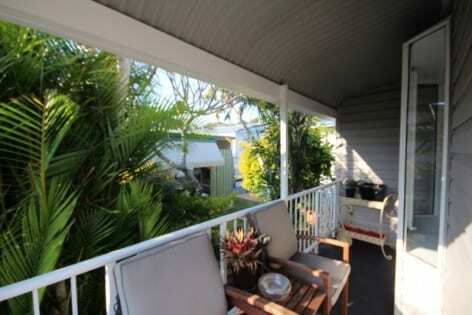 Wrap around verandah for further outdoor relaxing and enjoyment. 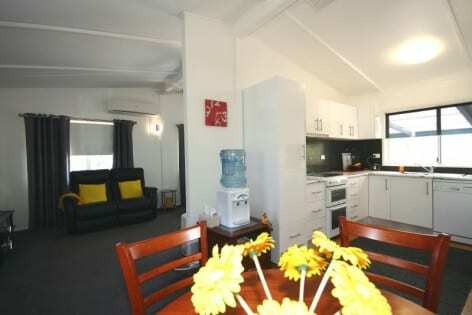 Comfortable airconditioned lounge with adjourning dining room. 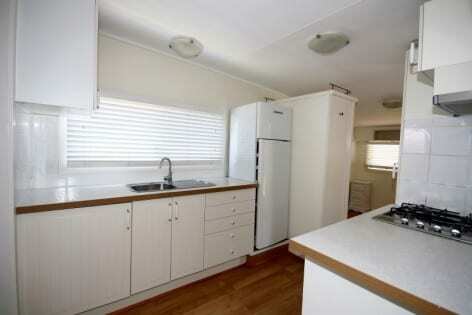 All you want in a modern kitchen with dishwasher and many cupboards. 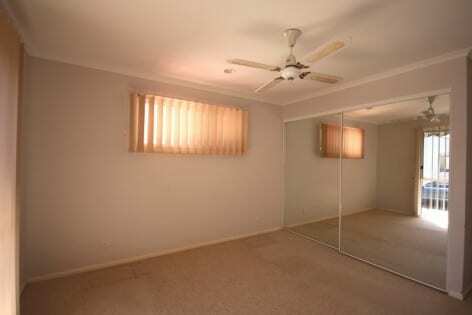 Main bedroom has mirrored wardrobe – both are light and airy. 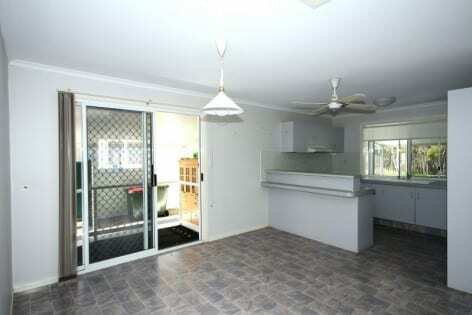 Lock up garage with adjacent small yard and large shed. 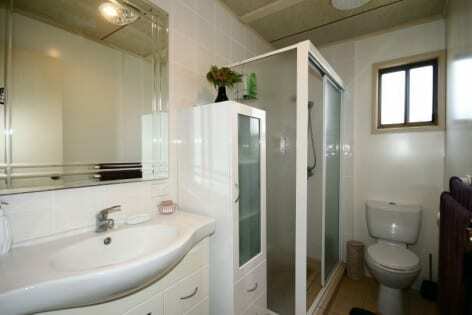 Modern bathroom completes this tidy home – Nothing to do. 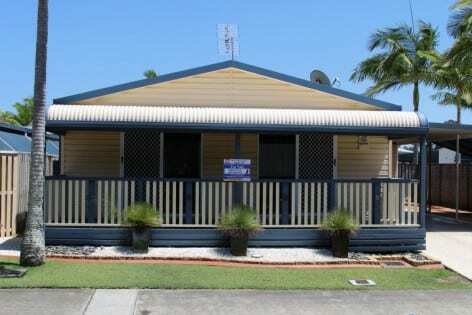 You rent the land and get pension rent assistance. Pay no rates. 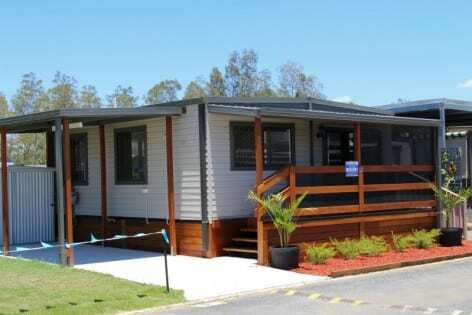 Royal Pacific Residences is located a short distance from the Tweed River with stunning views across Chinderah Bay to Mount Warning. 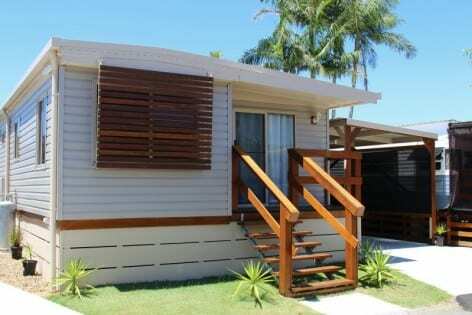 The park is ideally located for you to enjoy everything the Gold Coast, Tweed Valley and Tweed Coast have to offer. 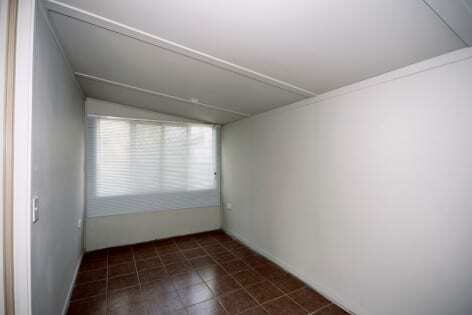 Charming and well-presented one bedroom home, with a good sized modern kitchen with a Westinghouse oven and a gas cook top fridge included. 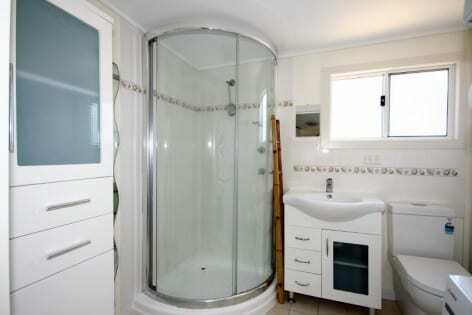 The bathroom is very modern with a curved sliding shower door, included in the bathroom are a front loading washing machine and a dryer. 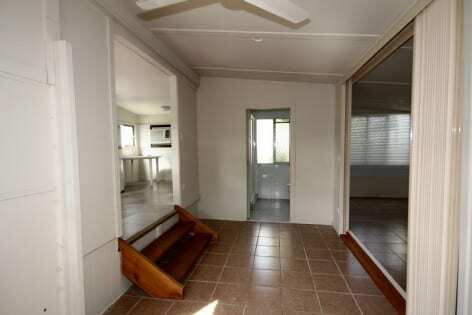 The Lounge dining area is open plan with reverse cycle air-conditioning, timber blinds and timber effect flooring which is throughout the home except the bathroom which is tiled, the under floor is Marine grade ply and the property is council approved. 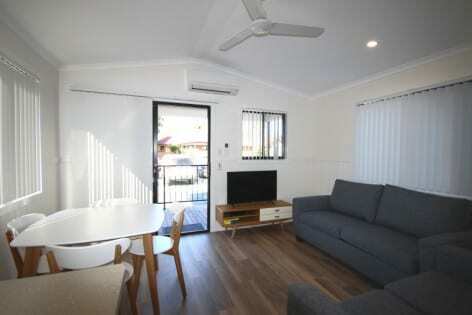 Other feature’s the property ready to connect for Austar/ Foxtel lounge wired with USB points and land line. 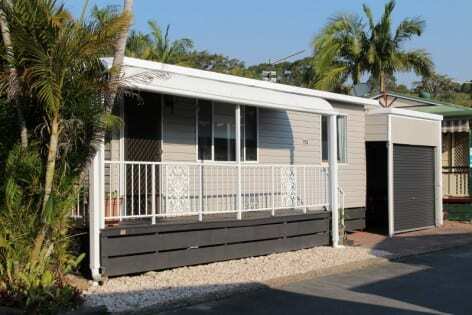 Situated just minutes from Tweed Heads/Coolangatta, The Palms Village is for the over 50’s and is ‘Pet Friendly’. 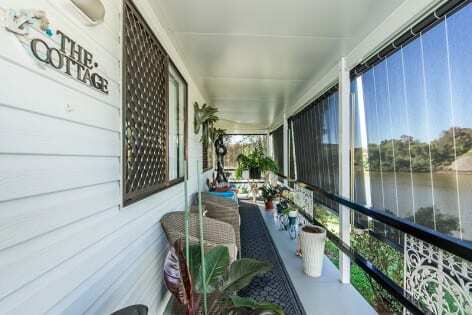 The independent lifestyle village is ideally located enjoy everything the Gold Coast, Tweed Valley and Tweed Coast have to offer in a secure environment. 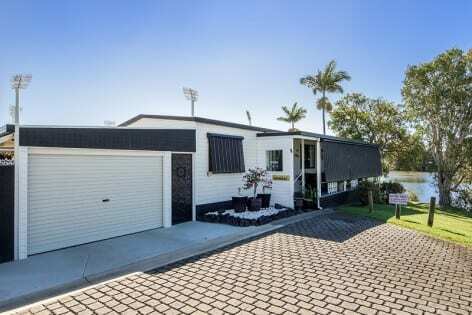 Recently renovated two-bedroom home is in a highly sought-after location on the perimeter of The Palms Village close to the Tweed river system. 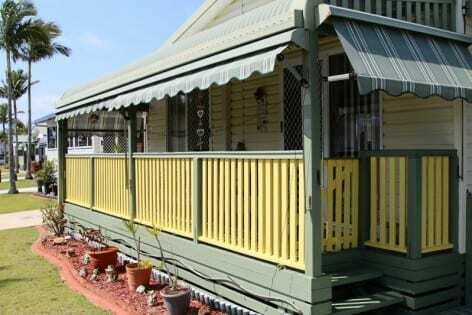 The home has new paint internally and externally including new gutters. 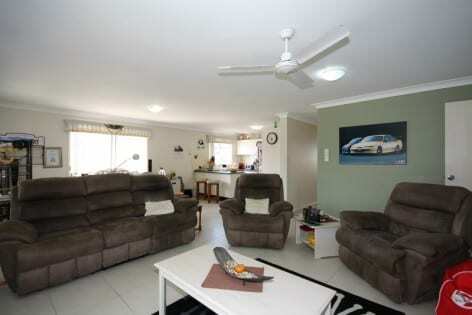 The living area has cathedral ceilings with new lights and fans throughout. 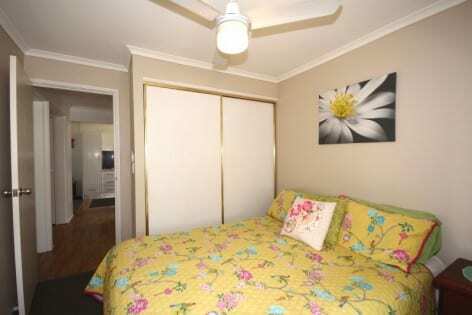 The home has new laminate flooring in all living area and bedrooms. 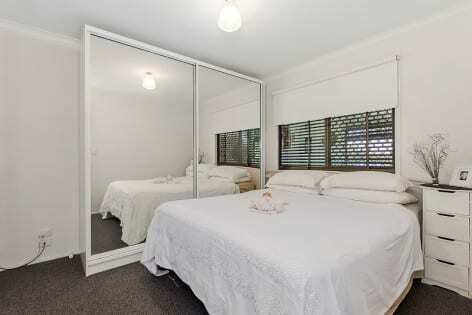 The master bedroom has built-in wardrobes with mirrored doors. 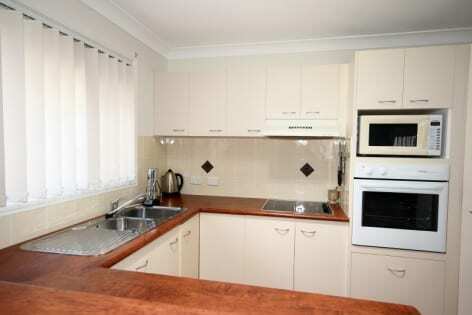 The kitchen has been renovated new cupboards and draws. 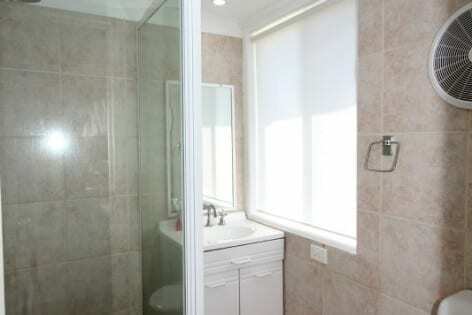 The Bathroom has been renovated with a modern shower and bath. 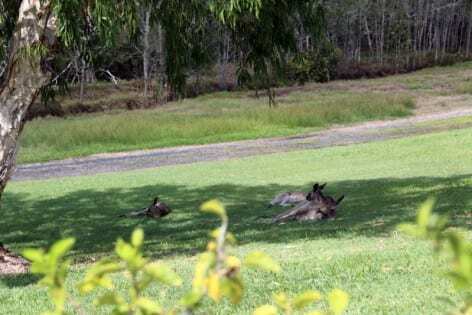 Just fifty meters to the local shops and about a hundred meters to the boat ramp and jetty. 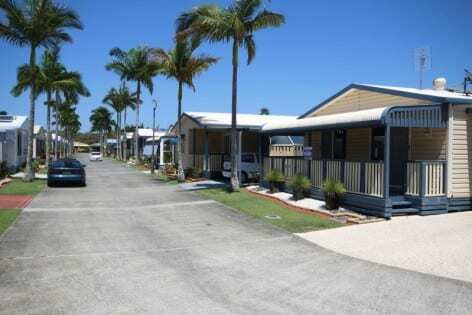 The Palms Village is ideally located for the over 50’s, just a stroll to the Tweed River, council boat ramp and local shopping centre. 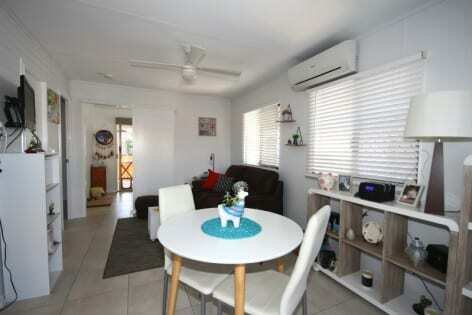 Charming two bedroom home with open plan living/dining area and kitchen. 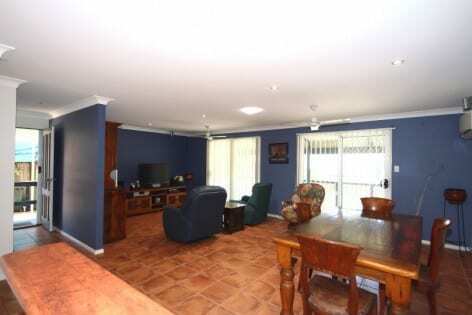 Living areas have recently been tiled throughout. 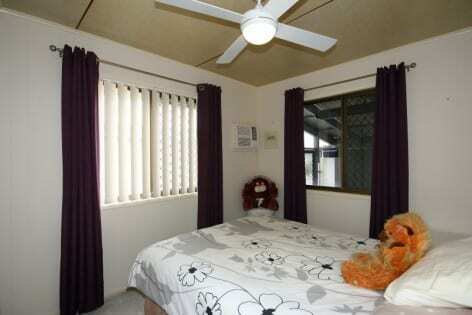 The home has an entrance porch, two carpeted bedrooms with built-in robes and ceiling fans. 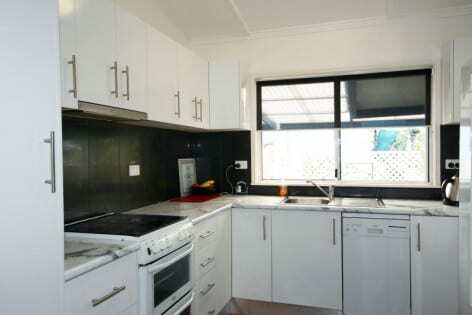 Good-size kitchen with plenty of storage space and ample benchtops/work-surfaces. 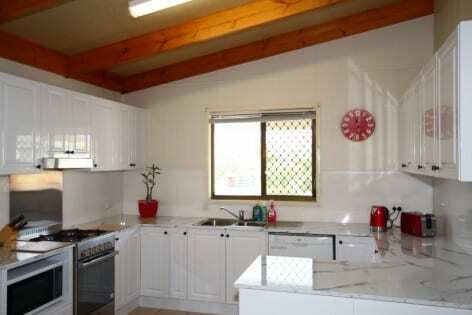 Kitchen has an electric stove with ceramic cook-top, stainless steel sink with double drainer and a bay window. 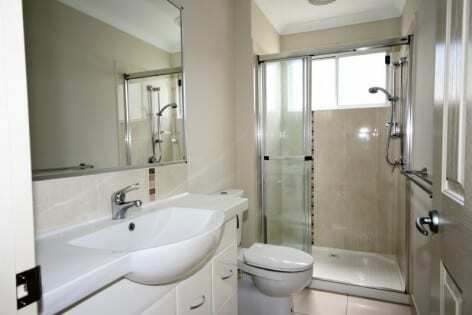 Bathroom consists of a large shower cabinet with easy access, vanity unit and separate toilet. 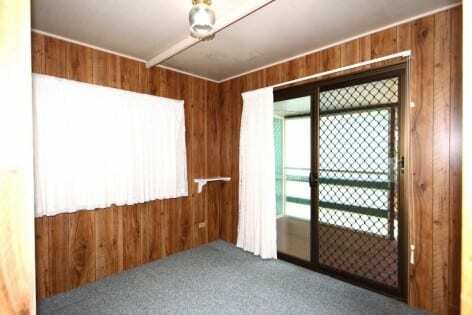 Internal laundry has external door opening to the carport. 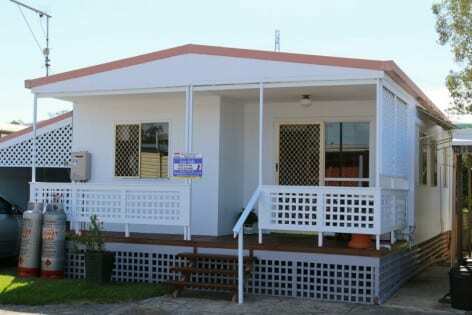 Energy efficient home with Solar panels and Inverter and Solar hot water service. 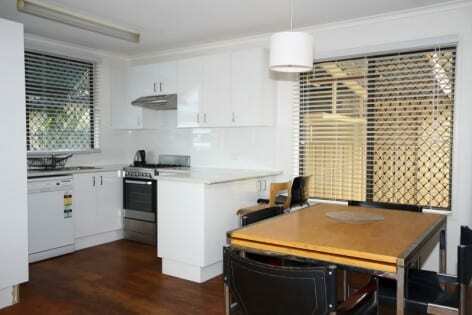 This immaculately presented and attractive home has been repainted throughout. 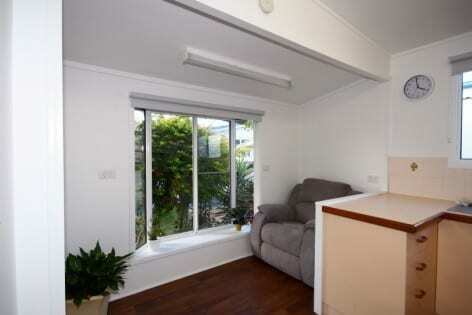 The home would be perfect for those who just wish to move in and enjoy, with nothing left to do! 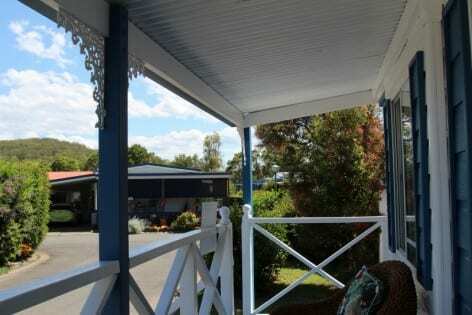 The home has an entrance porch that has been refurbished with new decking. 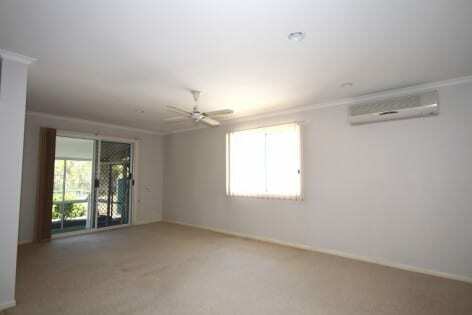 The open plan living area with raked cathedral ceilings has both ceiling fans and a relatively new Fujitsu reverse cycle air-conditioner. 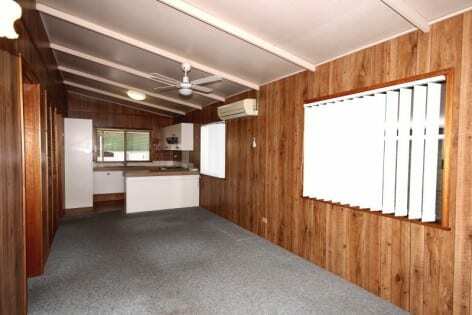 Cleaning of the dwelling is made easy with wood-effect vinyl flooring laid throughout the home. 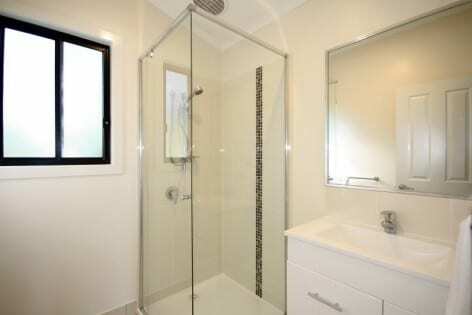 The bathroom comprises of a shower cabinet and a stylish vanity unit. 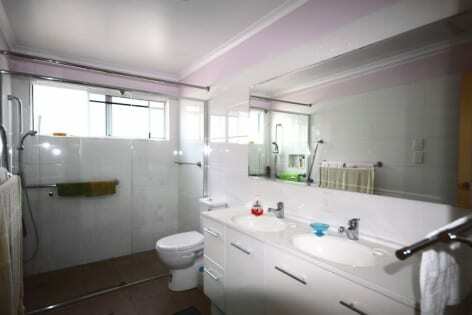 There is a separate WC with new twin-flush toilet and there is an internal laundry with new tub and fittings. 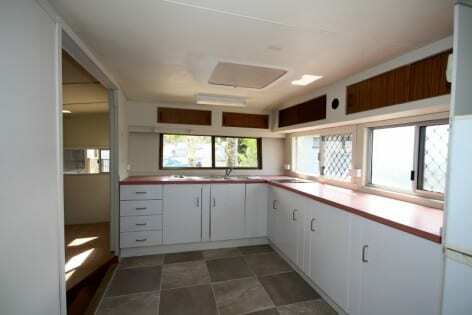 The functional kitchen and dining area have ample cupboard/storage space and there is a Simpson electric stove with new range hood. 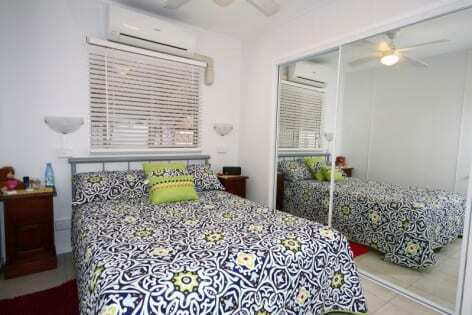 The good-sized master bedroom has a built-in robe and both bedrooms have ceiling fans. 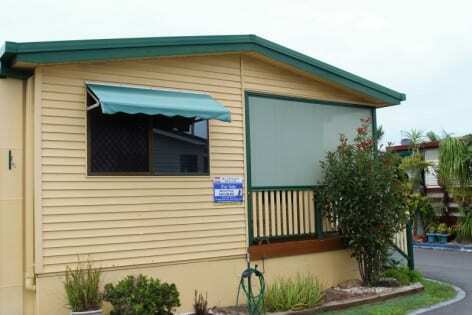 The roof has recently been repainted and security screens installed on all windows and doors. 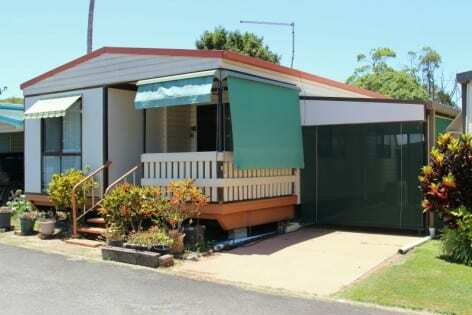 A single carport with good headroom and screened with a colour bond fence adjoins the home. At the rear of the home there is a paved court yard. 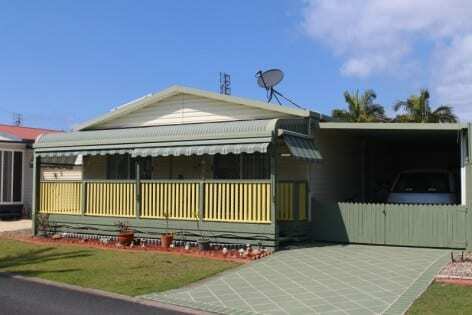 The home has a garden shed, relatively new hot water service and an ornamental front garden. 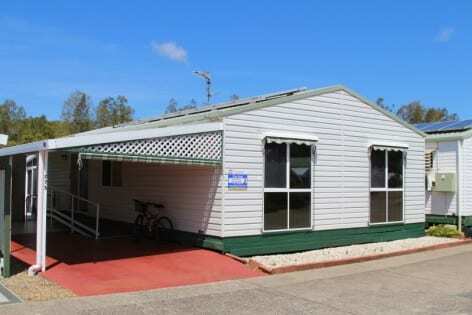 Energy efficient home with solar panels and a 3Kw Inverter. 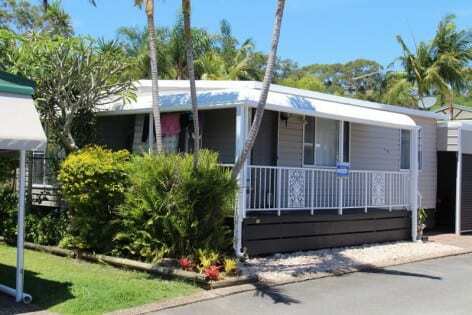 The Palms Village is situated just minutes from Tweed Heads/ Coolangatta. 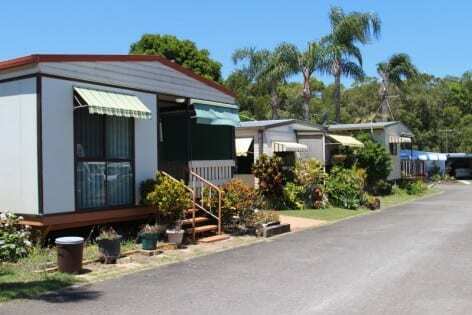 The over 50’s ‘Pet Friendly’ village is just a stroll to the Tweed River, council boat ramp and local shopping centre. 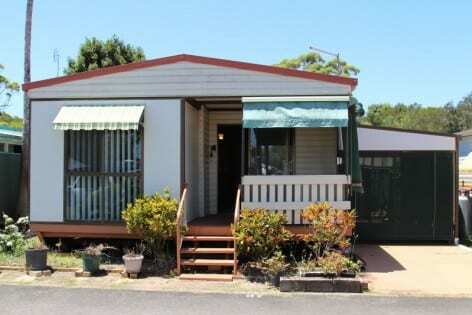 Nestled amongst the trees this, CHARMING AND WELL PRESENTED Two Bedroom Home has recently been redecorated inside and out, with New Timber flooring laid throughout the house, also new Carpet in bedrooms and new Blinds in all rooms. 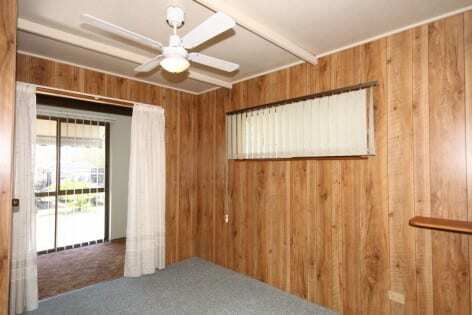 The Two newly carpeted rooms have built-in robes; Master with a ceiling fan. 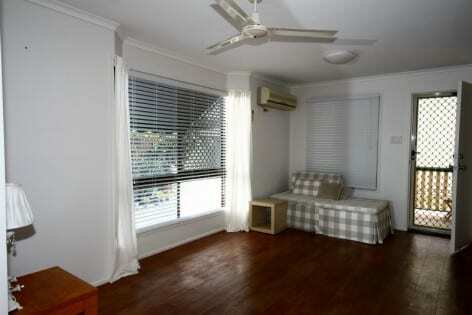 The open-plan home consists of a lounge with Bay Window, Reverse Cycle Air-Conditioner and ceiling fan. 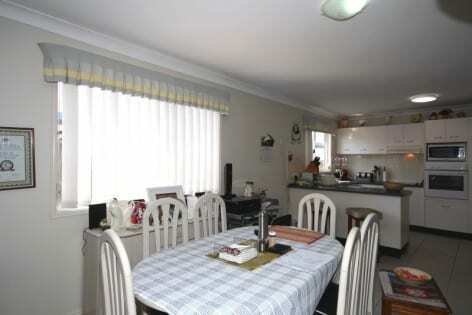 Adjacent kitchen and dining area with Bay Window. The kitchen has plenty of storage and work-surfaces with latte colored laminate bench-tops with timber trim and matching flat panel doors. A good size pantry. 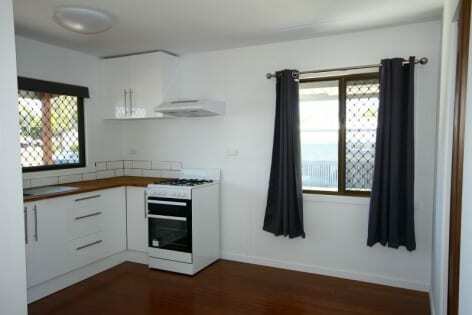 The kitchen is complemented with tiled splash-backs, stainless-steel sink and relatively new Stainless-Steel Chef Gas Stove. 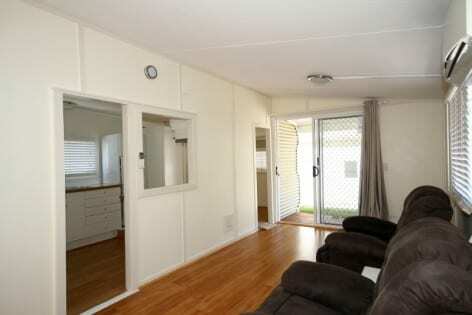 Simply Move in and Enjoy, nothing remaining to be done! 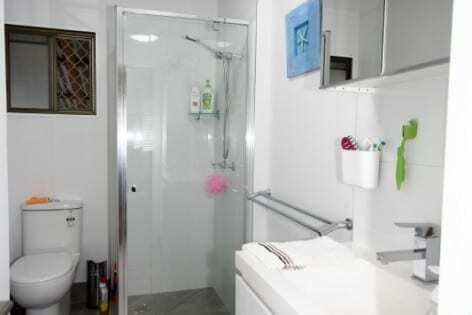 The Bathroom consists of a Shower cabinet and Vanity unit with a Separate Toilet. 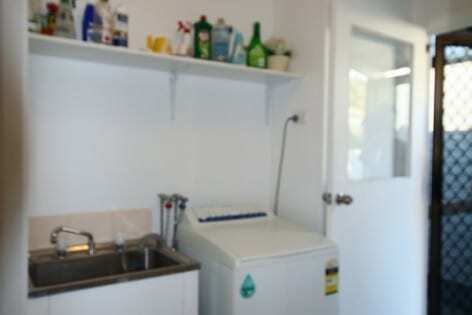 Next to the Bathroom is the Internal laundry with an External door leading to the carport. 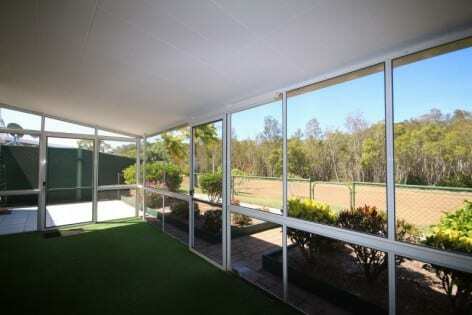 Adjacent to the home is a single carport with good headroom and a Remote Operated Roller Door. Carport has been Newly enclosed in as well. 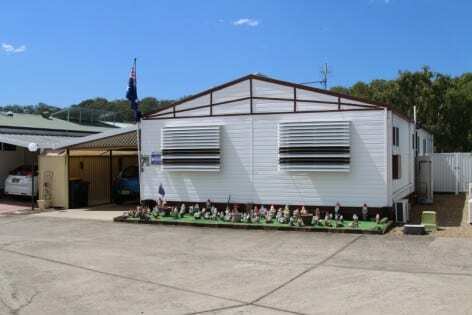 A Garden Shed is located at the rear of the Carport. 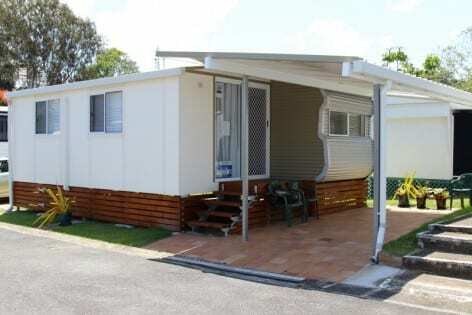 The Home features an L-shaped entrance porch/verandah with a bull-nose roof that wraps around the front and side of the home. 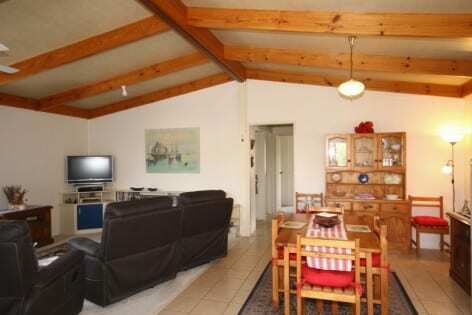 The home is close to the Entrance of the Village and is just a short stroll to the Village Club and the Shopping Centre. Village Amenities include 2 Swimming Pools, Spa, BBQ Areas, Club House, Social Club, Gym/Fitness Area and Holding Yard for Boats/Vans etc. 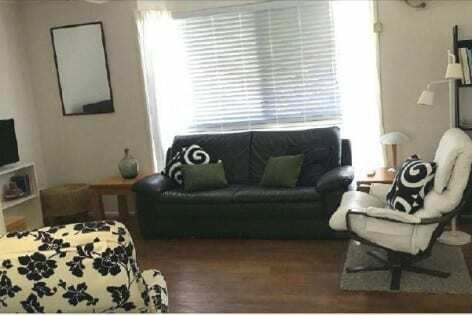 This immaculately presented 2 bedroom home consists of a covered entrance porch running the width of the home, two bedrooms and an open plan lounge/dining area with adjacent kitchen. 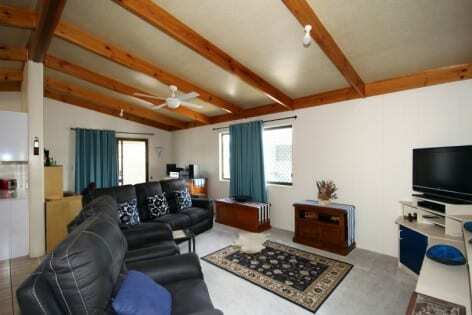 The living area features timber effect vinyl flooring and high raked ceilings creating a light and airy home. 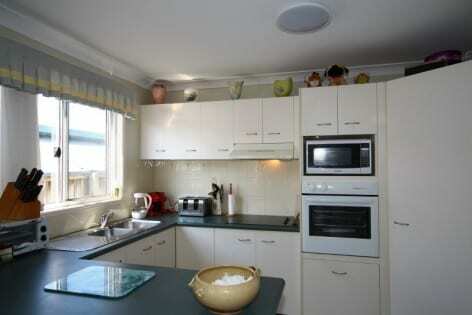 The practical kitchen has plenty of storage space with Caesar stone bench-tops/work surfaces. 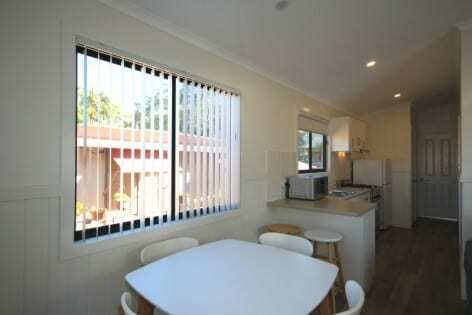 The kitchen is complemented with a Westinghouse built-in electric fan-forced oven with a gas cook-top stove, tiled splash-backs, double full-size sinks and a fully vented range hood. 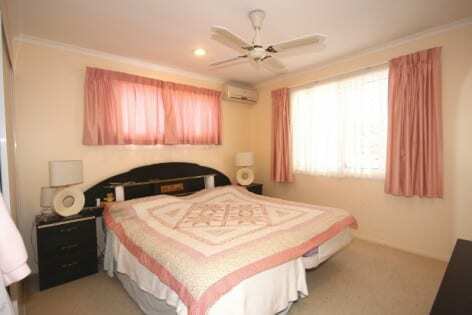 The home has two carpeted bedrooms; master has a built-in robe with mirror doors. 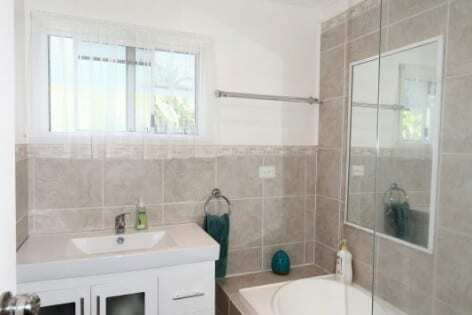 The good-sized tiled bathroom comprises of a shower cabinet, vanity, mirrored shaving cabinet and toilet, as well as laundry facilities tastefully hidden behind sliding doors. 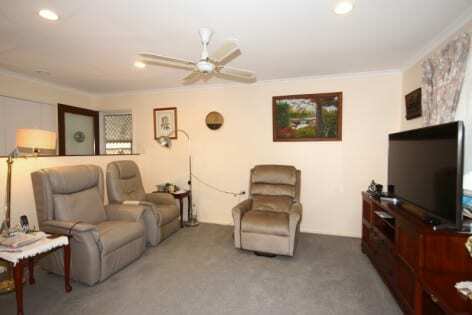 The home has a Fujitsu reverse cycle air conditioner, ceiling fans to the lounge & 2 bedrooms, a gas hot water service. 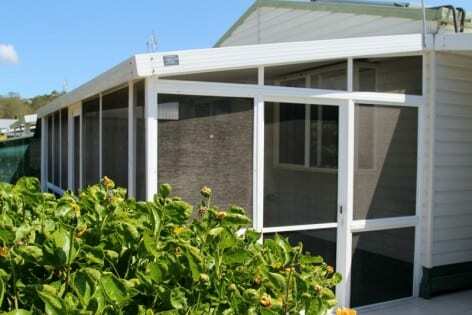 And outside an aggregate surfaced area to the side of the home, running the full length of the home, for your car as well as an outside entertaining area, where you can relax & enjoy the well-presented garden running the length of the home. 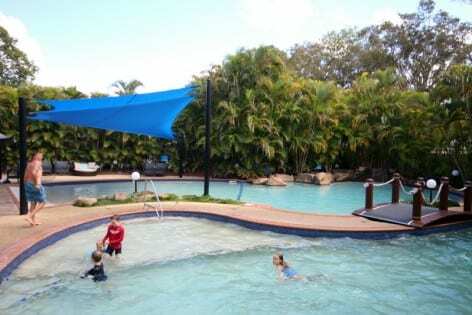 The park is a secure gated complex, and has its own protected saltwater billabong, as well as a swimming pool complex (heated in winter), a water park for the kids, luxury camp lounge/kitchen/BBQ/deck overlooking the billabong. 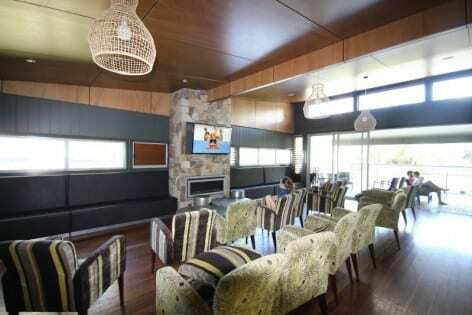 As well as games room, internet kiosk. 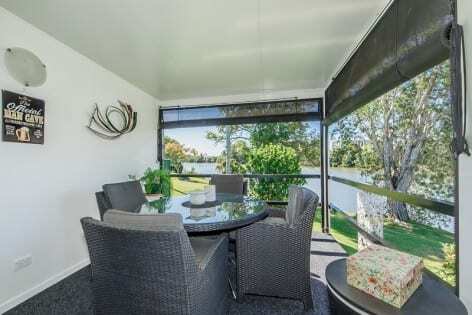 A great place to entertain your family / friends, just ask the current owner! 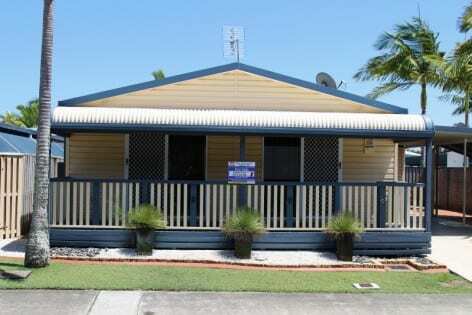 Spacious and immaculately presented two bedroom manufactured home at the popular over 50’s ‘Pet Friendly’ Tweed Broadwater Village – coming soon! 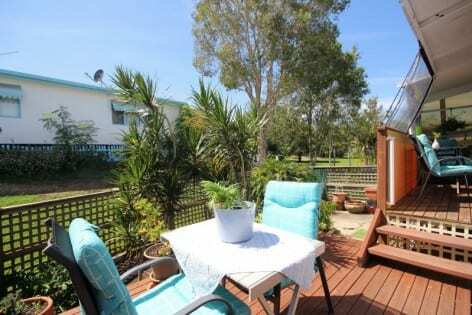 Situated just minutes from Tweed Heads/Coolangatta the ‘Pet Friendly’ over 50’s village is just a stroll to the Tweed River and there is public transport at the entrance to the park. 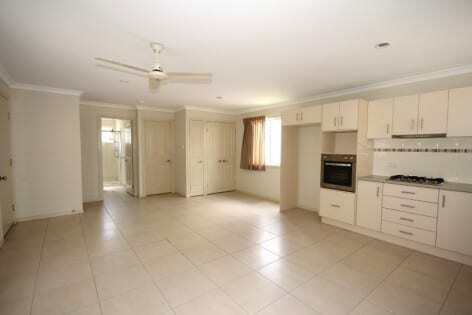 This spacious 13 metre home has recently been redecorated throughout and is ready to be moved into and enjoyed! 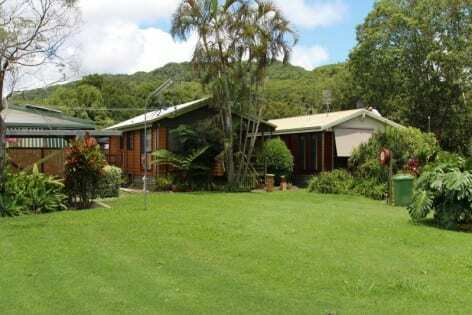 The light and airy home is located centrally in the village and is reasonably close to the village entrance and all amenities. 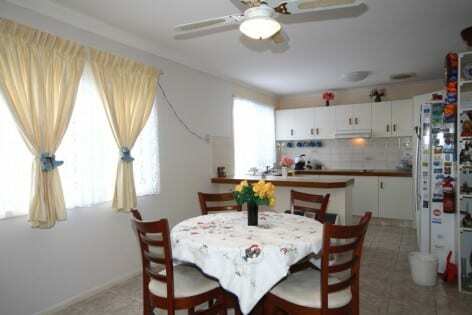 The open plan living area and kitchen is tiled and has both new ceiling fans and a split-system air-conditioner. 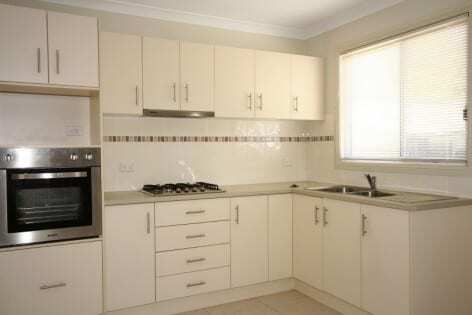 The kitchen has ivory coloured laminate bench-tops/work surfaces and sparkling white panel doors with stainless steel handles. 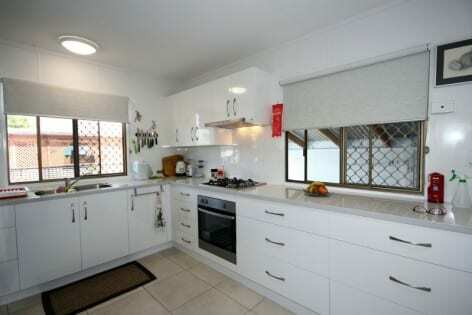 The kitchen is complemented with a new Bellini dishwasher, a relatively new Chef stainless steel electric stove with fan-forced over and grill, double sink and tiled splash-backs. 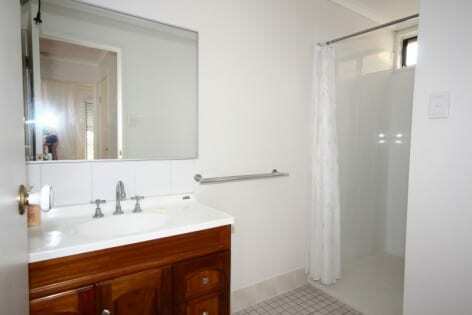 The newly, fully tiled bathroom consists of a shower cabinet and vanity unit with a separate toilet. 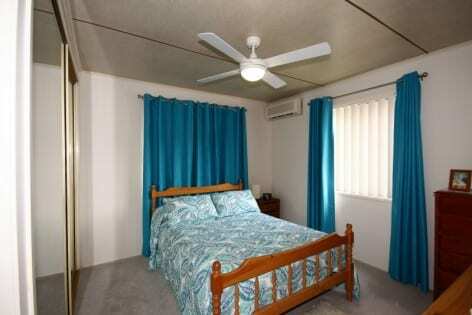 The home has two generously sized, newly carpeted bedrooms with mirror-door robes and ceiling fans. At the rear of the home is a fully fenced and low maintenance garden, making it an ideal home for your 4-legged companion. 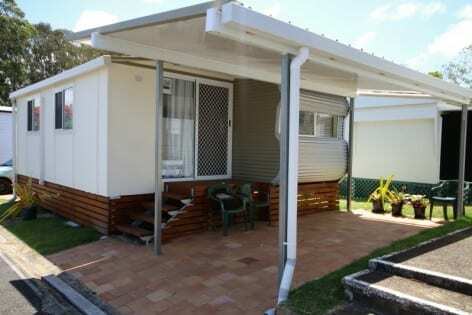 A carport adjoins the home that has been partitioned to create a 2nd living area or extra bedroom when the family visits and space for one large vehicle. 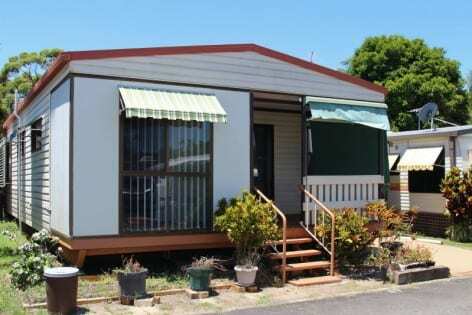 The home has an internal laundry, solar hot water service, newly installed solar panels with inverter, and two garden sheds. 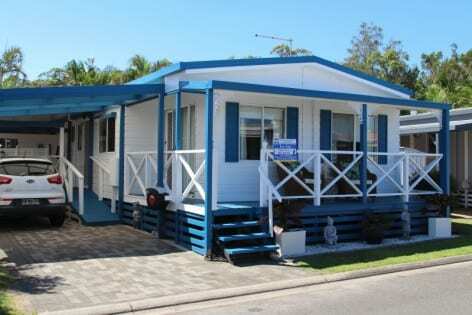 Village amenities include a swimming pool, club house, social club, and library.